OH, THE DRAMA — two MAPS 3 press conferences in one week on back-to-back days. The 1st was held on the steps of City Hall on Thursday, November 12. Negotiations between the city and the local Firefighters Union and the Fraternal Order of Police (who earlier formally registered the "NotThisMaps Coalition" as a political organization) had been going on for better than a week — were the citizens about to hear what probably most wanted, that an accord had been reached between the city and the unions and that we could now squarely focus on just the merits of the MAPS 3 December 8 vote? The 2nd was held at the Firefighter's union facility located at 157 NW 6th on Friday, November 13 (uh oh). One or more union meetings were held on the night before. Would the unions announce in their November 13 press conference that a deal had been struck? The above cartoon (with both credit and apologies to David Horsey of the Seattle Post-Intelligencer) tells the tale, and it wasn't probably what most of us were wanting to hear. This post contains the audio of each press conference, a few slides thrown in so you'll know who is talking, a summary, and this writer's analysis and personal opinion of the merits of the city vs. union matters insofar as the same pertain to MAPS 3. And here they are, transported back to 1889, with Henry Overholser's prefabricated buildings in the background, scavenger birds flying overhead, deja vu all over again. The November 12 press conference lasts about 9 minutes (but does not contain any Q & A since the NewsOK.com video didn't) and the November 13 about 11½ minutes. If you want to see the video files from which I ripped the audio, they are presently available at NewsOK.com: November 12 video and November 13 video. Mayor Cornett opened the November 12 press conference by saying that, in the last few years, "a strong economy has allowed us to support a high level of commitment to public safety." He reviewed the time since 1993 with the passage of MAPS, saying that the economy has benefited and that, "there is no question that public safety commitment has grown on an ever increasing basis." He noted that with the 2001 MAPS for Kids, the city council also passed a resolution that the accompanying use tax would be used for public safety. "MAPS has directly benefited public safety through the years." "Right now at a critical time in our city's history we're facing union efforts that I think are designed to confuse our voters into thinking that, somehow, that if MAPS passes, it creates public safety issues. And I can assure you that if MAPS does not pass our public safety issues multiply." "We have discussed ideas of how the accompanying MAPS use fee could be used not only used to support existing capital needs for public safety but also to actually increase the number of firefighters and police officers that we put on the street." He closed his remarks by saying, "We will not have that option if MAPS 3 does not pass." David Prater, former police officer and present District Attorney, was next. About the business community and city leadership, he said that he thinks, "they do believe in and support fire fighters and police officers." 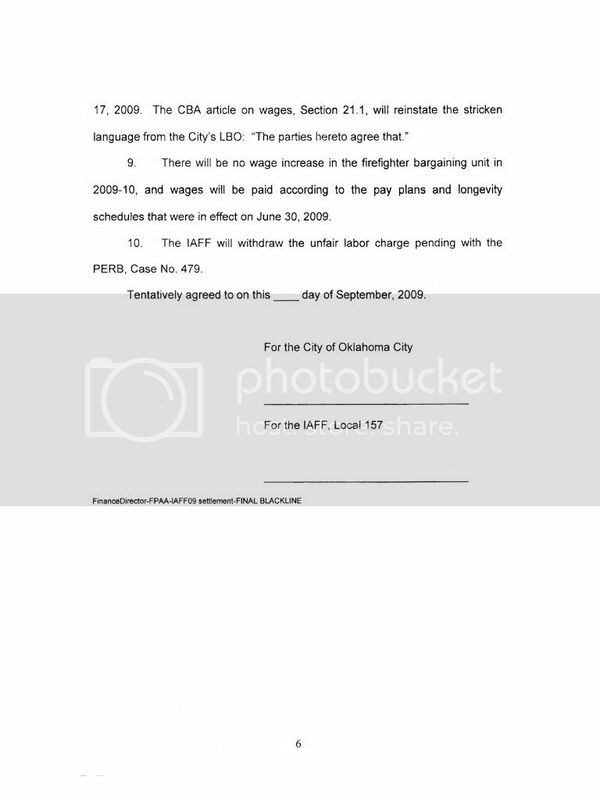 About a city offer to the police and firefighters unions, he commended mayor, city council, chamber, for "coming to some kind of a fiscally responsible resolution to this manpower issue — to start really looking responsibly at how we address the manpower shortage in Oklahoma City — and I believe their proposal through the MAPS 3 use tax has done exactly that. It will assure us that through rest of this fiscal year and next fiscal year we will see no cuts of police officers, period. No matter what we experience in our sales tax revenue shortfalls. In addition to that, they have proposed to add an additional 20 officers through MAPS use tax and an additional 7 officers through Cop grants. So we're looking at a swing, a possible swing, of 50 officers over the next couple of years. In addition to that, this city and their leadership has pledged that over the next 24 months they will sit down with our men and women in the firefighters union, our men and women in the police union, and work toward a long term effective solution to our manpower issue. And so I am hopeful that our men and women who are firefighters, our men and women who are our outstanding police officers in this city will take a good hard look at this proposal, this responsible proposal, that's been made by the City of Oklahoma City, and let's move forward and continue to grow this city in an effective and a responsible way." Gary Marrs, former Fire Chief and present Ward 1 council member, began by saying that, "When it comes to support for our public safety units, the frustration I have is that the message is being sent out there that the council doesn't support public safety, or hasn't supported it, or that MAPS specifically hasn't supported it. And that's just not true. If you look at our current budget this year, current general fund budget, 285 million dollars of that goes toward public safety, that's 2/3 of our general fund budget. And, you know, I, I don't know how you can say we don't support public safety when you make that kind of commitment on a yearly basis." "Specifically, how does MAPS support it? The MAPS for kids use tax has provided over 60 million dollars for public safety. So, the importance of the MAPS program can't be overstated, I don't think. And, you couple that with the mayor's comment on how the economic development, the economy in Oklahoma City, is as strong as it is, we think, because of the MAPS program, and because of that economy we haven't had the layoffs and we haven't had to furlough people. And you don't have to go very far outside of Oklahoma city to find that that's not true elsewhere. So, I think the issue of do we support public safety as a city and as a council, we can stand on the fact of what we've put into it so far. It's just a critical time right now. If we do believe that the previous MAPS has created a city where the economy will continue to support the priorities that we place out, it's a critical time to continue the growth of that. And the MAPS initiative that you're going to vote on December 8 will do just that. When you look at the kind of projects and the kind of growth that you're going to get in the city and how that can continue to grow our economy so we can continue the priority that the council has placed on it, and will continue to place on it. If we don't pass MAPS and we don't get to gain the strength that that will bring to our economy, then I don't think that's going to be a good thing or be something we want to forecast at this point in time." "I just think it's critical to understand how important it is for public safety instead of being a detriment to public safety." Mayor Cornett closed the press conference by saying, "Also, I want to remind everyone in this city of one of the key elements that has allowed our city to progress in the manner that it has, and to elevate ourselves and be very competitive in a national environment, and that's the unity that this city has obtained and earned through the years. We have so many people, the business community, the voters, the leadership at city hall, all pulling on the same rope. And now's the time for us to come together and do it one more time in the most important election of our time, MAPS 3." "Let me begin by saying that we are deeply disappointed but not surprised by the comments made by Mayor Cornett and others at yesterday's news conference. The December 8 election is about the citizens of Oklahoma City deciding whether or not they want to approve a package of projects that are totaling 3/4 of a billion dollars and it's not about negotiated issues between police and fire and the City of Oklahoma City. As public servants we want to make it very clear that we love this city very much and have dedicated our lives to protecting the citizens of this city. We have established enormous public trust by providing excellent public safety services and programs. For these reasons we feel that MAPS 3 is a bad plan. We feel like that for weeks the mayor has touted a list of projects in the MAPS 3 initiative which would include a downtown convention center, a new 70 acre central park, a new rail-based street car system and improvements to the Oklahoma State Fairgrounds. Yet never once has the mayor talked about public safety needs as a part of that list. Not one time have you seen mention of public safety on their website or in any of the printed brochures or audio-visual presentations from the Yes Maps coalition. Not until yesterday. And I believe we all know why. The mayor and others have come to realize that the public, by and large, does not support this MAPS. This MAPS proposal costs too much money for too many unneeded projects at a time when too many people are concerned about their own jobs, not a pie in the sky promise of new jobs that might be created if MAPS 3 passes, if MAPS 3 passes. Furthermore I believe the public is both aware and concerned that they have adequate fire and police protection before they have another nice park or even sidewalks or riding trails." "This coalition wants to be perfectly clear about our intentions and goals. Police and fire are united in this efforts to defeat this MAPS proposal because it costs too much — 777 million dollars for too long — 7 years — with no written guarantees that named projects will ever be funded or in what order. The citizens of Oklahoma City work too hard, love their community too much, to give a blank check to a bunch of politicians in these uncertain economic times. Firefighters and police officers are joining ranks with citizens from all parts of the city and all walks of life in this campaign. We will knock doors, we will put up signs, make calls, and do everything possible to get our message out about why this is not a good proposal and should be rejected by the voters on December 8." "I would just like to further add that we believe the comments yesterday from the mayor about the use of use tax money for public safety funding I think confuses the public. We believe that whenever you make a very public statement like that, it falls in line with what we've said all along about the MAPS 3 initiative and about it not being specific enough for the voters to understand or to have an assurance that those projects will be completed as has been touted all along. The use tax funding proposal gave no specifics as to how much of the use tax dollars would be used for public safety or now long the use tax would be committed to public safety or how those dollars would be allocated to public safety. Again, no specifics, no plan, no direction, and this is what we feel like the MAPS initiative as it currently stands is all about." "As has been said, it's not about defeating MAPS, it's about this particular package. It's way too much money at this particular time for projects that there's very little accountability for. We want the city to do better than this. I think the city can do better than this. I think we can put a better package out there for the voters to give them the same satisfaction that they would receive from this but at a lot less cost. It is my hope that if this goes down in December that we can come back with something later on that addresses the needs of Oklahoma City and not just a bunch of wants. So, I appreciate the opportunity to stand up here with these guys who serve the citizens like I do every day and say that this is a project that we can do better with and we expect to do better with and the citizens deserve better than what this is." After making comments about how people could become involved in the campaign, Phil Sipe opened the floor for questions. "There's 3/4 of a billion dollars in this proposal. $175 million of that is stuff that people want. There's $600 million of that people don't want. So they're spending a lot of money on things that are not wanted. And the only reason that they're doing that is because is because that's the only way you'd get the support of the Chamber. So basically they're spending $600 million dollars to convince themselves to vote for it." Following up, he said, "The sidewalks polled very high. The trails polled very high. But a number of the other projects, specifically the convention center, polled very very low, I think it was in the low 30%. And that is the most expensive project on there. And it also doesn't complete the convention center. That's only the first portion of that, it's not the complete thing. So at some point down the future, the citizens would have to foot a bill of another, say, quarter of a billion dollars, to finish it out." UNION PRESS CONFERENCE (continued) A question was asked about whether the city's offer involved using the use tax. About that, Phil Sipes said, "Yes, in fact they have. It relates to the use tax comments that I made earlier. But the problem is, what if it fails. If it fails then any of the promises that have been made will not happen. The staffing that they promised will not occur; the staffing for police will not happen." Gil Hensley added, "They did make a proposal, John, and we looked at it very seriously. Here's the problem. We're police officers and we're fire fighters because we want to serve the citizens of Oklahoma City, not because we want to serve ourselves. It would have been very easy for my membership to take their 13 pieces of silver and go on and discount the citizens. That is not the goal here. The goal is, this not a good plan for the citizens of Oklahoma City. This is not a good plan. There may be a good plan that can encompass public safety, encompass some infrastructure growth, to patch pot holes, to do the things city government ought to be doing. Yes, they offered us a proposal. It was at best a pittance to attempt to buy us off. We will not be bought off. We have been threatened, we have been intimidated, we have been vilified as union people. We're hard working citizens of Oklahoma City just like many of the people out there are that'll have to vote on this issue, and we want them to understand, yes, we rejected that proposal, and we rejected it because it was not in the best interests of the citizens of Oklahoma City." His comments drew a round of applause from the group of assembled members of the NotThisMaps coalition. Responding to a question about whether communication had been made with the city, Phil Sipe responded that the same had occurred and that the group had announced "in a very formal way" that they are in opposition and will continue to campaign. With a few closing comments, the press conference came to an end. THE CITY'S OFFER. So, just what the heck WAS the city's offer that was rejected by the unions? I'm not able to give a 100% answer to that question, but I do have a document which gives almost all of it -- the offer to the Firefighters and Police -- and it is set out below. 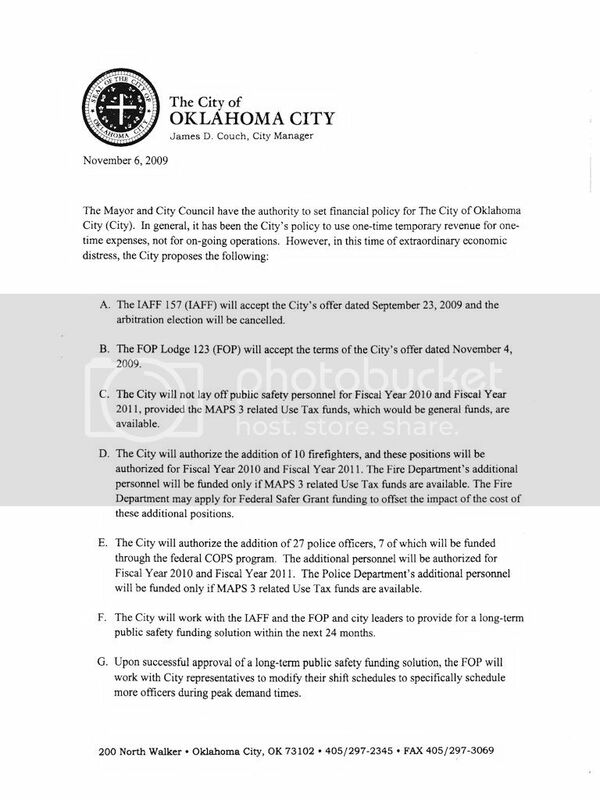 What's missing is the presumed attachment to the Fraternal Order of Police, presumably the document identified in paragraph B of the City Manager's November 6, 2009, memorandum, below. Keep in mind that negotiations didn't just start in November but that they had been on-going for at least a few months. Remember that the Firefighters had already won an arbitration hearing which was not at all involved with the FOP position. 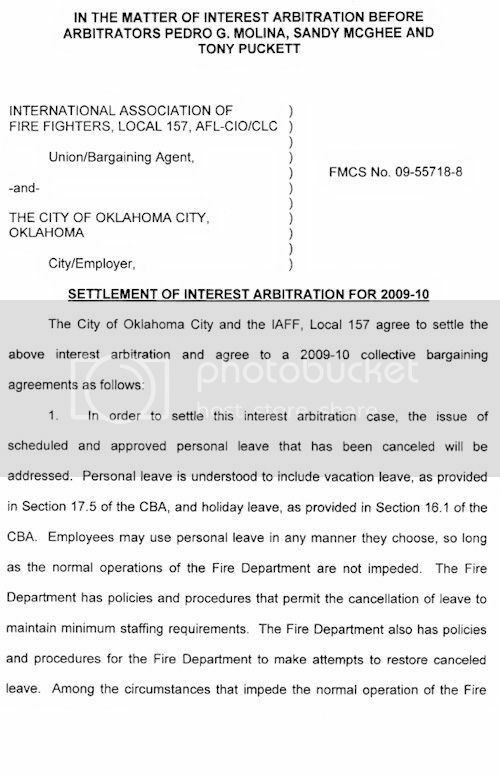 The Firefighters also had (and still do) a pending unfair labor claim against the city which is referenced in the last page of the of the city's September offer, shown below. The point is, the respective union positions with the city were not at all identical and, in fact, the Firefighters had much more going for its position than the FOP did. 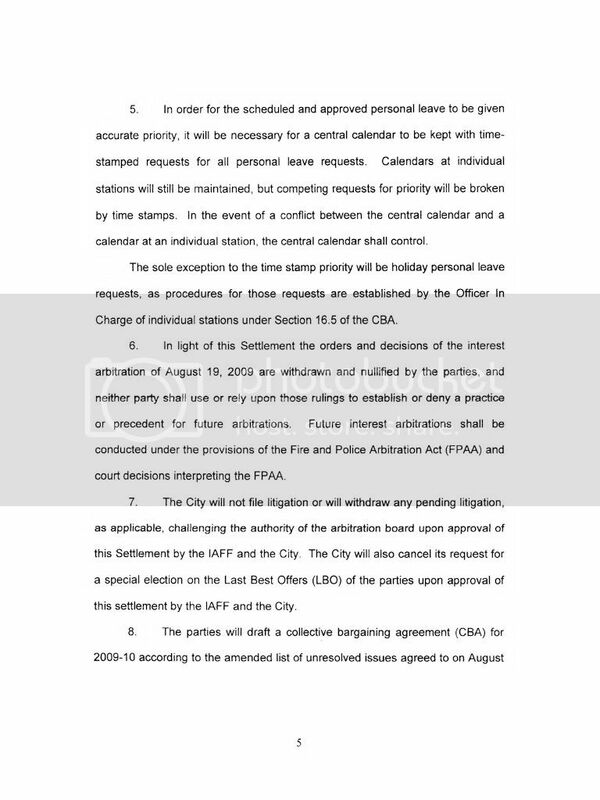 The document below references an offer dated September 23 by the city to the Firefighters and another dated November 4 to the FOP. The September offer to the Firefighters is the attachment to the November 6 cover memorandum from James Couch, City Manager, shown below. I do not have possession of the November 4 offer to the FOP (but see the FOP's November 10 counteroffer, below). Both such offers which predated the City Manager's November 6 memo are integral to and an understanding of the full context of the city's November 6, 2009, offer. The city's November 6 cover memo references both unions and its offers to both of the city unions. I've placed the November 6 City Manager memo and its Firefighter attachment in this PDF file for your easy download, but each of the 7 pages is fully set out below in graphic file format. I resisted the temptation to OCR the document since that might denigrate the authenticity of the document and I did not want that to happen. What you are seeing below are literal scans of the actual offer by the city to the Firefighters, submitted by the City Manager on November 6. 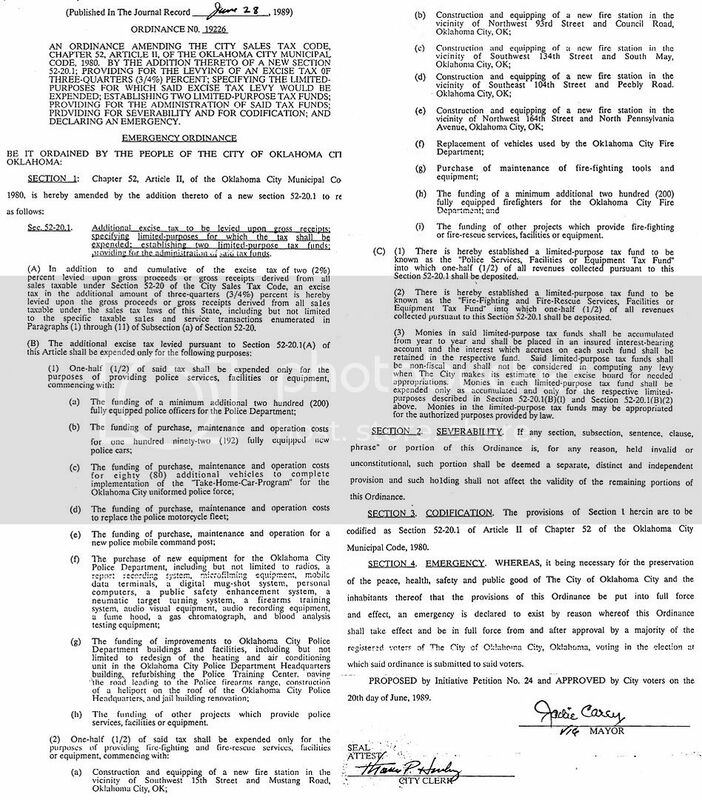 For each page below, click on the image for a slightly larger view. 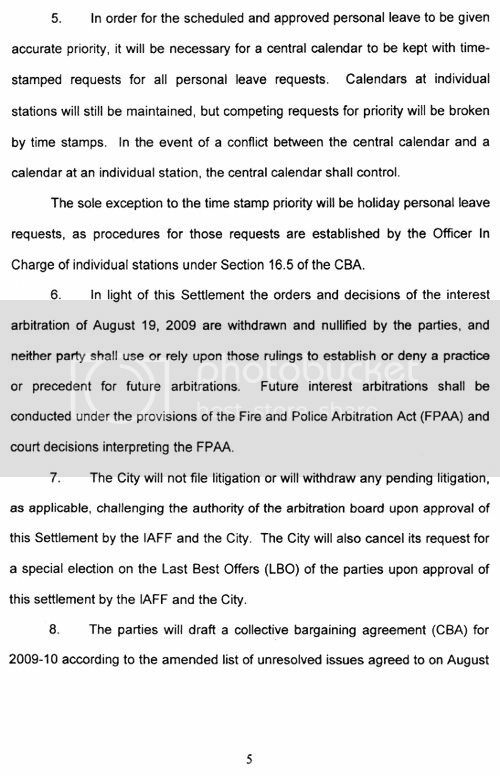 The city's September 23 offer (the attachment to the memorandum) would be accepted and the arbitration election (scheduled for sometime in 2010) would be canceled. 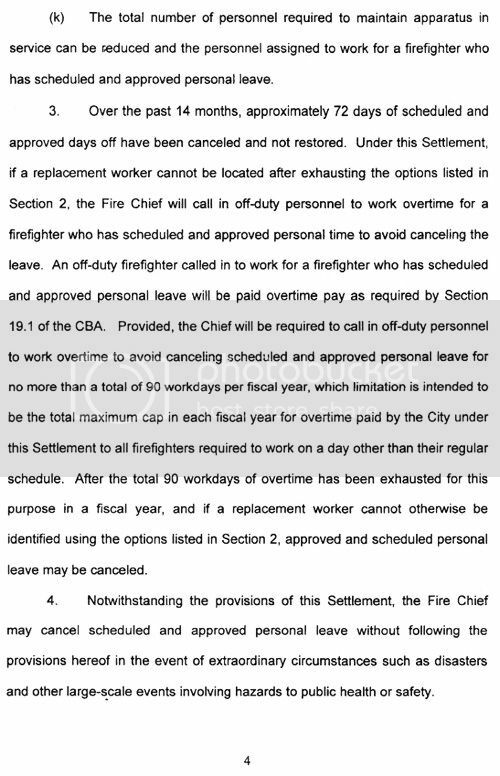 The Firefighter's grievance against the city for unfair labor charge (¶9 of the city's September offer) would be dropped. No layoffs would occur in 2010 and 2011, "provided the MAPS 3 related Use Tax funds, which are general funds, are available." 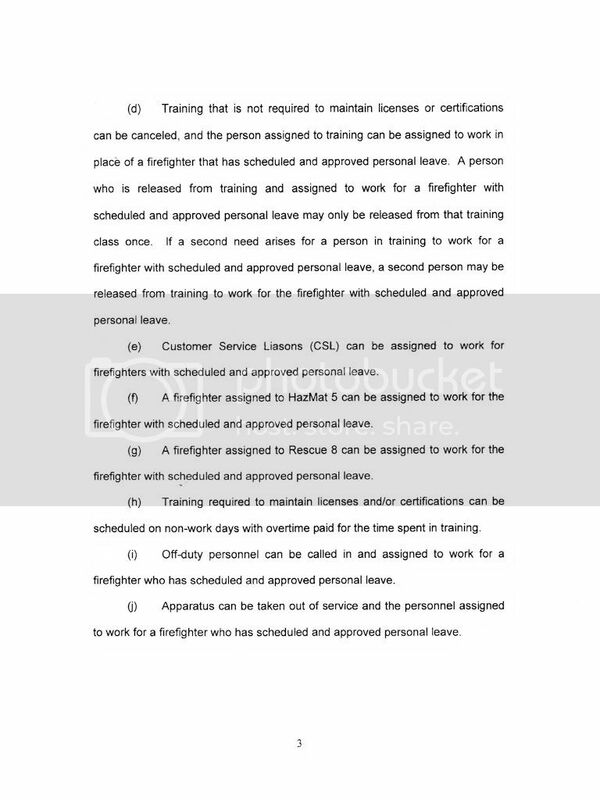 10 additional Firefighters would be authorized for fiscal years 2010 and 2011, subject the the terms of Couch's letter, paragraph D.
The city committed to work with both unions to provide a long term funding solution within the next 24 months. The city would authorize the addition of 27 police officers, 7 of which would be funded through the federal COPS program. OK. Pistols have been drawn, shots have been fired. Where does that leave regular people who are not involved in the union disputes with the city? Where does that leave MAPS 3? Point of Beginning — Where's the Class? Before getting into substantive analysis, something needs to be said: Leaders on both sides need to quit acting like little kids with pop guns, tone down the rhetoric, evidence a degree of humility, and show greater respect for the other side. Being for or against MAPS 3 doesn't make someone a bad, despicable person. "Right now at a critical time in our city's history we're facing union efforts that I think are designed to confuse our voters ..." says the mayor, and "... the comments yesterday from the mayor about the use of use tax money for public safety funding I think confuses the public," says Phil Sipe. Rhetoric abounds about "unions," "a bunch of politicians," and, the cheapest shot of the lot (so far), "13 pieces of silver." 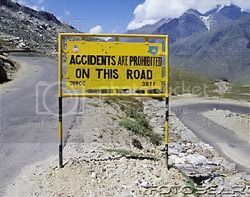 Next thing you know, each side will begin putting up road signs something like these. 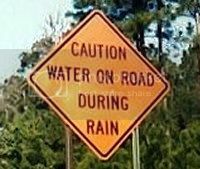 We don't need rhetoric ... we can figure out if the road is wet. It's getting so bad that GW is even confused ... er ... maybe that's a bad example. ... and no one wants that to happen, do they? Voters don't want this shootout. We want to see dignity, we want to see humility, we want to see class. The presence, or absence, of all three is easy to spot. The citizens of Oklahoma City deserve class. The above is from the 1976 movie Network. This is one of the tougher parts of analysis because it presumes to overlay an objective analysis based upon a speaker's subjective choice of words. In this, I'm assuming that words used should be taken to mean their well-established meaning, according to usage of the English language in our country. I'll supply dictionary definitions, as needed. And, for whatever my opinion is worth, I'll rate the credibility of remarks and indicate whether a "fear factor" was employed, as well. THE CITY'S PRESS CONFERENCE. Let's look closely at some of the city's press conference remarks and see how they stand the light of day (and additional thought and information). Item 1: "Right now at a critical time in our city's history we're facing union efforts that I think are designed to confuse our voters into thinking that, somehow, that if MAPS passes, it creates public safety issues. And I can assure you that if MAPS does not pass our public safety issues multiply." Item 1(a): Is this is a critical time in our city's history? The answer naturally depends upon how one defines, "critical time in our city's history." The Random House College Dictionary, Revised Edition (Random House 1975), in the context of use of the term here, says, "6. pertaining to or of the nature of a crisis; crucial: a critical moment. 7. involving grave uncertainty, peril; dangerous: a critical wound." Those definitions were clearly the context of David Thompson's remarks in the October 21 "Breaking Through" Chamber luncheon when he said, "If it does not pass, I say it sets us back 10 years. We cannot let that happen." The mayor's above remark strikes me as falling into the same category. Item 1(b): Is union opposition to MAPS 3 designed to confuse voters into thinking that MAPS passage would create public safety issues? If that has occurred, I'm not aware of it. Perhaps I missed it. Publicly, union opposition claims that it opposes MAPS 3 because it is too expensive and is generally a bad plan for the city; more realistically (as will be observed below when the unions' press conference is dissected), union opposition is based on what the unions perceive to be the city's inattention to police and firefighter manpower needs, fueled by a history of the city not following the letter and/or spirit of existing ordinances and contacts. I'll get back to that shortly. Item 1(c): If MAPS does not pass, are our public safety issues going to multiply? Notwithstanding the mayor's assurance that they will, such a statement just doesn't compute. For a moment, imagine that no MAPS proposal was before the voters right now at all. None. Imagine that no MAPS proposal was going to occur even in the foreseeable future. Suddenly, or even over the foreseeable future, are public safety issues going to multiply? Are we about to become more crime-ridden? Are fewer fires going to get put out? The blatant statement that, suddenly, public safety is going to suffer without MAPS 3 is not only false, it is misleading. Is our economy, which is good, suddenly going to turn bad, and, if so, for what reason? This statement simply makes no sense at all. Plus, the fear card was played. Item 2. "We have discussed ideas of how the accompanying MAPS use fee could be used not only used to support existing capital needs for public safety but also to actually increase the number of firefighters and police officers that we put on the street." He closed his remarks by saying, "We will not have that option if MAPS 3 does not pass." Analysis. Four items are involved here, itemized below. Item 2(a): Did the city make a proposal to the unions to use the accompanying MAPS 3 use tax to provide resources to improve capital needs of the respective unions? No. See the the city's offer, above. The offer makes no mention whatever of capital improvement needs of either the police or firefighters. Item 2(b): Did the city make a proposal to the unions to use the accompanying MAPS 3 use tax to maintain existing public safety manpower levels and increase them over the next two years? Yes, but only if MAPS 3 passes. That contingency seems fair enough since the accompanying MAPS 3 use tax would be the source of funding and if MAPS 3 does not pass that funding resource would not be available. For fiscal years 2010 and 2011, the city committed not to lay off any public safety personnel, and also committed to add 10 firefighters and 20 police (plus another police through the federal COPS program. Recognizing that this was an interim solution, the city committed to negotiate with the unions during the 2 year period for a permanent solution. In taking this position, the city deviated from its reasonable standing policy not to fund permanent staffing with temporary tax revenues. But, also, see Item 2(d), below, which also lowers the rating here. Item 2(c): Was it reasonable to tie the above staffing matters to the passage of MAPS 3? Yes, since, if MAPS 3 does not pass, the accompanying MAPS 3 use tax would not be available to fund the city's offer. Item 2(d): Aside from the contingency of MAPS 3 passing, was the city's offer concerning staffing matters unconditional? No. I have no additional documentation concerning the city's offer to the FOP (that being the associated city offer dated November 4), so I cannot speak to that. But, as to the city's offer to the firefighters, acceptance of the city's September 23 offer was also required. That offer is the attachment to the city's November 6 offer, above. 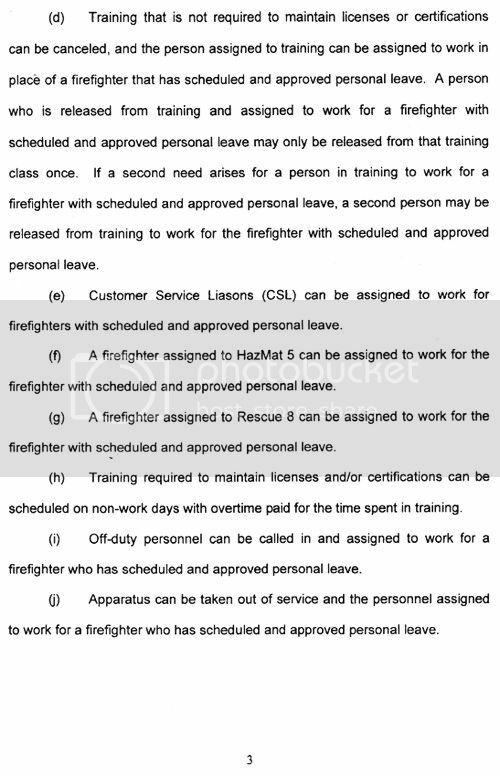 In order to gain the staffing assurances in Item 2(b), above, the firefighters would also be required to make several other concessions to the city as well. So, to the extent that the mayor's and district attorney Prater's comments make no mention of those concessions, which neither of them did, the 250-watt-bulb-brightness of the city being willing to agree to what, on its face, is presented as something of a breakthrough as to staffing matters in Item 2(b) becomes more like a dimly-lit-15-watt-bulb, the kind that is probably in your oven. The city tied Item 2(b) to important additional concessions by the firefigthers which were not stated by the mayor or the district attorney or by council member Marrs. To the extent that the city's press conference wholly omitted mention of those important concessions that the city required, the offer, presented by the city as a magnanimous generous offer to the firefighters, comes off looking much more miserly. Some of those additional concessions even involved matters of safety to the firefighters while on duty where they might be placed in harms way if the city's offer were accepted. More about that before this analysis is done, but, for now, it is sufficient to say that the city absolutely DID NOT lay all its cards on the table about the offers submitted in its November 12 press conference and that the glossy statements about manpower staffing were misleading. Item 3: David Prater's comments. Aside what I've already said above, I don't see that the district attorney really added very much ... generalizations without detail and a hope that the unions would support what the city has proposed. Prater won his campaign for District Attorney a couple of years back with the support of the FOP, and his role was apparently intended to appeal to that constituency. For analysis purposes, he said nothing really significant and I'm only adding Item 3 just to let you know that I thought about it and decided to say nothing more than what I already have. Item 4: Ward 1 Council Member Gary Marrs: "When it comes to support for our public safety units, the frustration I have is that the message is being sent out there that the council doesn't support public safety, or hasn't supported it, or that MAPS specifically hasn't supported it. And that's just not true." *** "Specifically, how does MAPS support it? The MAPS for kids use tax has provided over 60 million dollars for public safety." Analysis. I'm going to be less detailed about Gary Marrs' comments than I was in Items 1-2, but I'll mention a couple of things. His remarks were obviously intended to be general so I'll not fault him for a lack of specifics. Fair is fair. I'll critique his comments only in a general way. Item 4(a). Does the city support public safety? Well, of course it does and Marrs is correct in his statement that the unions are implying, if not explicitly stating, that the city council does not support public safety. Generally, a very large portion of the city's budget does indeed go to public safety and that fact is something not mentioned in the unions' counterpoint. Item 4(b). Does the city support public safety issues sufficiently? This question is obviously much more relevant to the matter than the above, and in his omission to address this question, Marrs' comments missed the real mark and seriously impaired his overall credibility. Item 4(c). Marrs makes the point that previous MAPS, particularly MAPS for Kids, have provided many millions of dollars for public safety via associated use tax provisions. He is completely right about that. He also states that MAPS 3 associated use tax revenues could and likely would do the same, and he is right about that, also. Item 5: Mayor Cornett said, "Also, I want to remind everyone in this city of one of the key elements that has allowed our city to progress in the manner that it has, and to elevate ourselves and be very competitive in a national environment, and that's the unity that this city has obtained and earned through the years." Of all positions mentioned in this press conference, the unity matter is the mayor's strongest point, in my opinion. A substantial diminishment of that unity would indeed be an unfortunate thing. However, also in my opinion, the mayor appears not to consider the city's role in the possible fracturing of that unity, including this press conference. If that occurs, not only are the unions to be blamed, the city is, also. This concludes my analysis of the city's press conference. BOTTOM LINE: The city's November 12 press conference to the public did not accurately portray the facts and issues involved with union negotiations, played the fear card, and was combative, not congenial, in tone. UNIONS' PRESS CONFERENCE. The unions' press conference on November 13 responded to the city's on November 12, and the offer made by the city on November 6. Here's my analysis, for whatever it may be worth. The unions' press conference did not involve the use of any "Fear Cards" like the city's did but did interweave some "Cheap Shots" which the city's did not. So, I've modified my rating tables accordingly. Item 1, Phil Sipe: "Let me begin by saying that we are deeply disappointed but not surprised by the comments made by Mayor Cornett and others at yesterday's news conference. The December 8 election is about the citizens of Oklahoma City deciding whether or not they want to approve a package of projects that are totaling 3/4 of a billion dollars and it's not about negotiated issues between police and fire and the City of Oklahoma City. As public servants we want to make it very clear that we love this city very much and have dedicated our lives to protecting the citizens of this city. We have established enormous public trust by providing excellent public safety services and programs. 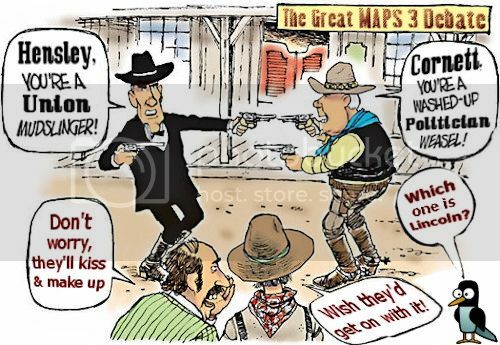 For these reasons we feel that MAPS 3 is a bad plan." Item 1(a): Is union opposition to MAPS 3 based upon the MAPS 3, per se? No. In a November 3 Journal Record article, Sipe was quoted as saying, "We still hold out hope that we can come to some kind of last-minute resolution of the staffing issues that we have," Sipe said. "So we’re not entirely resigned about running a campaign against it. We’re actually trying to work out a resolution so that they address staffing needs." In a November 10 Journal Record article, another quote from Phil Sipe appeared: "'To be completely open here, that's what we've been talking about. Once the (staffing) problem goes away, then I'd think the (MAPS 3) opposition would go away,' said Sipe, who heads the International Association of Firefighters Local 157. ¶ A resolution could be reached as early as Tuesday, he said." Later in the same article: "Sipe said that although he has told city officials that the MAPS 3 opposition could evaporate, it's not entirely up to him. ¶ 'That is one of the things that's really up to the membership. They're the ultimate authority here. If they're willing to reverse the previous stand they've taken and decide to rescind that original decision, then we're certainly willing to do a 180-degree turnaround and support it,' Sipe said." 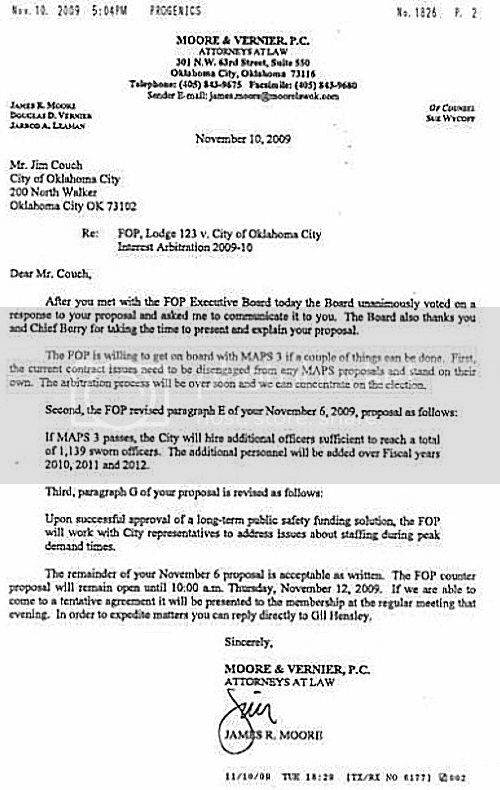 Also, in the Documents Appendix here, see the November 10 letter from the FOP's attorney to the City Manager, wherein it is stated, among other things, "The FOP is willing to get on board with MAPS 3 if a couple of things can be done," and the letter otherwise describes the FOP counteroffer to the November 6 city offer. Item 1(b): Is union opposition to MAPS 3 based upon negotiated issues between the city and the unions? Yes, notwithstanding Phil Sipe's press conference remarks. 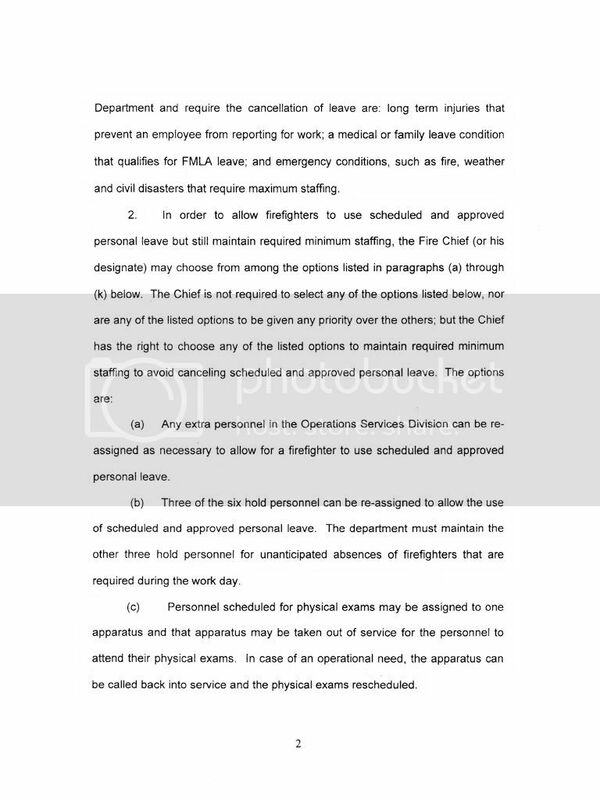 In addition to the quotations from two Journal Record articles, above, take a look at Phil Sipe's memo to firefighter union members in the Document Appendix, below. Every single remark relates to the insufficiency of the city's offer, and not a word relates to the merits or demerits of MAPS 3. Had the city and the firefighters come to terms, it is evident that firefighter opposition to MAPS 3 would have gone away. Item 2, Phil Sipe: "Yet never once has the mayor talked about public safety needs as a part of that list. Not one time have you seen mention of public safety on their website or in any of the printed brochures or audio-visual presentations from the Yes Maps coalition. Not until yesterday." Analysis: What he said is correct, but what he said is also beside the point. All MAPS initiatives have been for capital improvement projects based upon temporary sales taxes, and one would not expect permanent staffing needs to be funded with temporary taxes — and certainly the unions wouldn't want that since staffing, and not buildings, is the thrust of the unions' goals. The unions doubtless know that MAPS 3 could not address their permanent staffing needs and that those needs would require a vehicle other than MAPS 3 (such as an additional permanent 1/4 ¢ sales tax, as an example). Notwithstanding city policy, the city's November 6 offer nonetheless made various commitments (no layoffs, some additional personnel) to use a MAPS 3 associated use tax for a two-year period and committed to negotiate with the unions during that time to find permanent funding solutions. Item 3, Phil Sipe: "The mayor and others have come to realize that the public, by and large, does not support this MAPS." Analysis: Unless Phil Sipe has a mighty fine crystal ball in his pocket, his 1st sentence is obviously unsupported hyperbole. If the unions have a well-done scientific poll to support such statements, give the public a look at it — no such poll has been presented. Item 4, Phil Sipe: "This MAPS proposal costs too much money for too many unneeded projects at a time when too many people are concerned about their own jobs, not a pie in the sky promise of new jobs that might be created if MAPS 3 passes, if MAPS 3 passes." Analysis: Compare the above with Mr. Sipe's comments in the two Journal Record articles mentioned in Item 1(a), above. Had staffing needs been resolved, outside of MAPS 3, "then we're certainly willing to do a 180-degree turnaround and support it." As to the contingency about using MAPS 3 use tax money as outlined in the city's offer, well, of course the offer was tied to MAPS 3 passing. Something is better than nothing. To preserve their various positions if MAPS 3 does not pass, the unions could have easily counter-offered, "OK, we'll take the offer but subject to the following proviso: If MAPS 3 does not pass, then this agreement will be null and void and will have no effect on any of the items described herein," or something like that, but no such counter-offer was made. But since the city's offer was oblique on that possibility, I'll give Sipe's comment a middle credibility score. Item 5, Gil Hensley: "This coalition wants to be perfectly clear about our intentions and goals. Police and fire are united in this effort to defeat this MAPS proposal because it costs too much — 777 million dollars for too long — 7 years — with no written guarantees that named projects will ever be funded or in what order. The citizens of Oklahoma City work too hard, love their community too much, to give a blank check to a bunch of politicians in these uncertain economic times." Analysis: The above needs to be broken into parts. Item 5(a): Cost and duration. No need exists to be repetitive — see Item 1(a), above. If staffing issues had been resolved, cost and duration would not have been a union issue. Item 5(b): Lack of guarantees. He is correct about that. There aren't any. Although a less vitriolic tone and a more reasoned presentation would have served him better, he is correct that whether the projects get done depends upon trust — trust that the mayor and council will see MAPS 3 through over a period of 7 ¾ years. Whether to extend that trust to present and future mayors and city council members does indeed involve a judgment call and that is a call that each voter will have to make. Item 5(c): Blank Check to a "bunch of politicians." More macho hyperbole, pure name-calling demagoguery (note: a demagogue is a political leader who appeals to popular desires and prejudices). Item 6, Phil Sipe: "The use tax funding proposal gave no specifics as to how much of the use tax dollars would be used for public safety or now long the use tax would be committed to public safety or how those dollars would be allocated to public safety." Analysis: Not correct. The city's use tax commitments were for a period of two fiscal years and covered an itemized number of staff, and also covered a no lay-off obligation during the two fiscal years. Maybe that commitment was seen as insufficient, but it was defined. Item 7, Brian Walters: "It's way too much money at this particular time for projects that there's very little accountability for. We want the city to do better than this. I think the city can do better than this. I think we can put a better package out there for the voters to give them the same satisfaction that they would receive from this but at a lot less cost. It is my hope that if this goes down in December that we can come back with something later on that addresses the needs of Oklahoma City and not just a bunch of wants." Analysis: Ward 5 council member Brian Walters is certainly entitled to his opinion, but the guiding principle behind the original MAPS, and this one, IS about needs — it's just that Walters hasn't got the foresight to see the projects as such. Walters could easily have made the same observations about original MAPS concerning the Bricktown canal, the Oklahoma River project, the downtown library, improvements to the Civic Center Music Hall, the Bricktown AAA baseball field, and the sports arena, etc. Were those projects "needs" or were they just "wants?" You figure it out. Would any of you want this city to be today like it was in 1993, before MAPS? Guys like Walters might be good for doing tax accounting, but they are not good for being visionaries. A Neal Horton or a Ron Norick, he is not. Good leaders are not just concerned about fixing sidewalks or making sure that the sewer system is up to par. Good leaders also have vision, a quality apparently lacking in the young fellow from Ward 5. Item 8, Gil Hensley: "We're police officers and we're fire fighters because we want to serve the citizens of Oklahoma City, not because we want to serve ourselves. It would have been very easy for my membership to take their 13 pieces of silver and go on and discount the citizens. That is not the goal here. The goal is, this not a good plan for the citizens of Oklahoma City. This is not a good plan." "It was at best a pittance to attempt to buy us off. We will not be bought off." Analysis: You've got to be kidding. This guy is the best spokesperson the FOP's got? Sure thing: Union personnel are not primarily looking after their own interests, they care about ours more? See Item 1(a), above. Sure thing: The city representatives are those guys who offered Judas a bribe (by the way, it was 30, not 13, pieces of silver) and the unions are not about to be cast in the role of Judas in this made-for-prime-time movie. Nothing wrong with throwing religion into the pot, is there? After all, Christmas is approaching. This concludes my analysis of the unions' press conference. Bottom Line: The unions' November 13 press conference to the public did not accurately portray the facts and issues involved with union negotiations, was marred by cheap shots, and was combative, not congenial, in tone. This appendix isn't about MAPS 3. When you cut the wheat from the chaff, the press conferences weren't particularly, either, despite the fact that the speakers said that they were. Even though the speakers wore MAPS 3 masks, what was really going on had to do with long-standing police and firefighter staffing issues with the city and the public got a taste of it in the pair of press conferences. Personally, I don't make a connection between MAPS 3 and the unions' staffing and other issues -- I see them as comparing apples and oranges -- and the unions' positions won't cause me to vote "No" on December 8. But, since we've been thrust into the middle of the union issues, it's probably best that we know more about those issues than we heard in the press conferences. 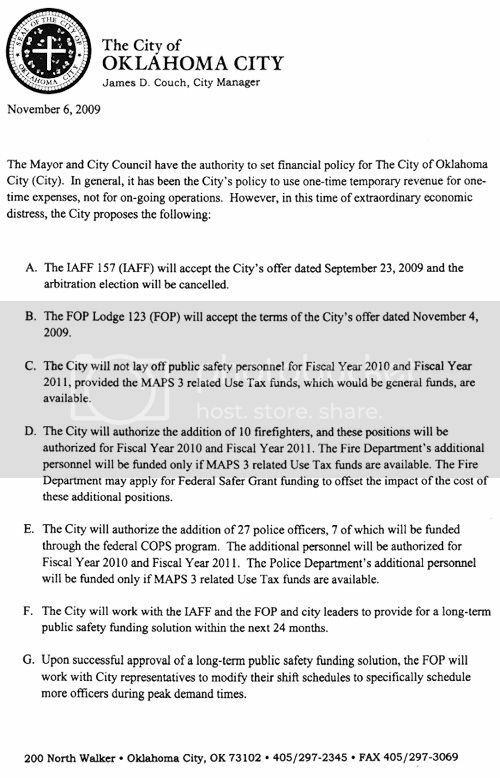 This appendix contains documents which relate to the issues between the city and the firefighters and a single document concerning the FOP -- the last item. I do not have other documents pertaining to the FOP else I would present them also. PHIL SIPE MEMO TO UNION MEMBERS. 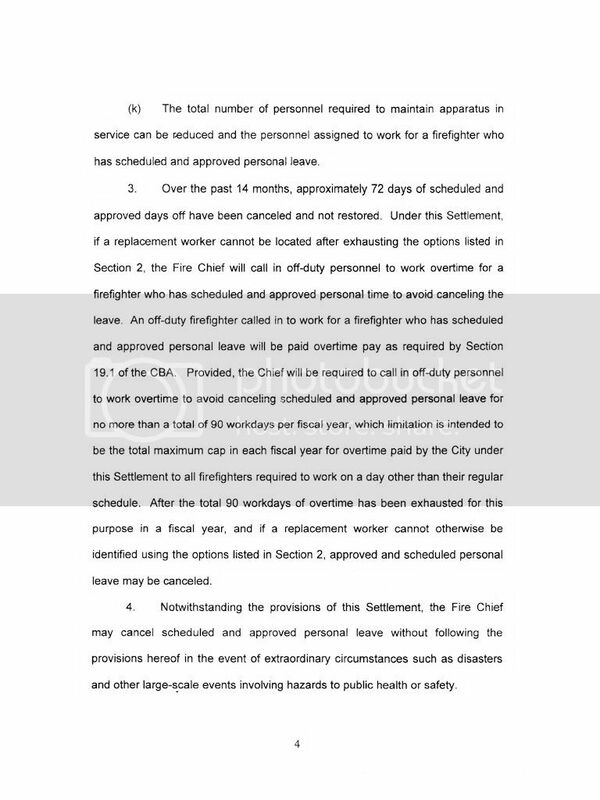 Following the city's November 6 offer and the firefighters rejection, Phil Sipe, president of the Firefighters Union, circulated the document below to the union's membership. At the Union meeting (11/10/09) I discussed an offer from the city that was given to me by Jim Couch on 11/6/09. I believe it very important that the membership stay well informed as to why the negotiation team chose to reject the offer. Below are the details of the offer, and I have added comments to explain our difficulties that resulted in a rejection of the offer. If you have any questions, please contact your V.P. or any member of the negotiation team (italics in underlined bold print is the actual language from the offer). A. 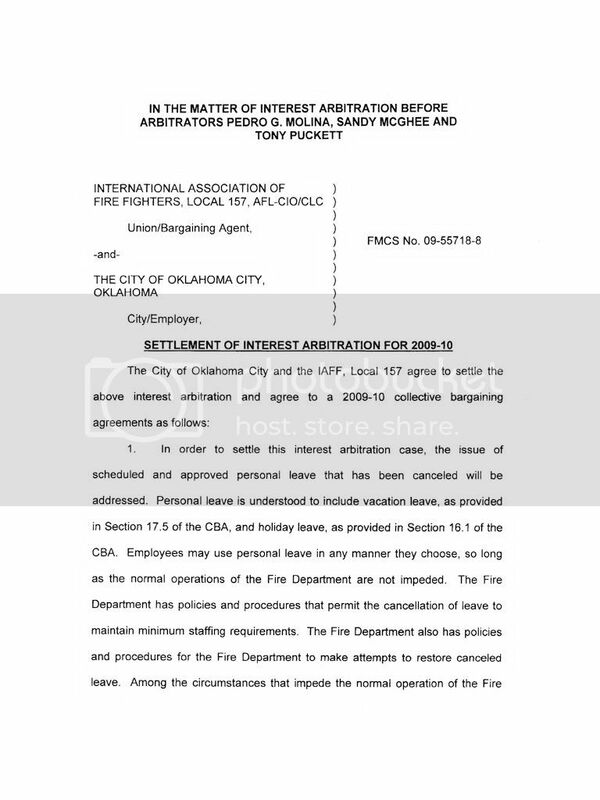 The IAFF 157 will accept the City’s offer dated September 23, 2009 and the arbitration election will be canceled. I. The offer would add significant language to policy that affirms the City’s position that they can cancel your day off. It would add FMLA and OJI as reasons why they can cancel your scheduled time off. Currently, that language does not appear anywhere in policy. Policy must be negotiated between your Union and the City. FLSA 7(a) employees (8 hour) may be used in suppression (we have already agreed this is not allowed). CSL’s can be assigned to work on suppression apparatus. A firefighter from HazMat [hazardous materials] 5 or Rescue 8 can be used. The Chief can call back up to 90 times, if a replacement cannot be identified through all the other options in the offer. 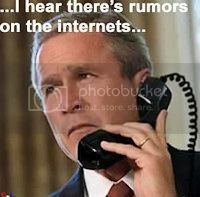 Does anyone believe that he would ever call anyone back, when he could always select the option to put less people on a rig, or worse, put a rig out-of-service? The offer would establish a central calendar. Control of the calendar at the station level would no longer exist. The offer said the City did not have to accept the decision of the Arbitrator who ruled that they violated the law. In other words, it would be as if the arbitration award never happened. The offer would have also required us to withdraw the Public Employees Relations Board (PERB) case #479. This was the 35A award (which establishes the fact that they have to provide day off slots) which the City refuses to comply with. B. The City will not lay off public safety personnel for Fiscal Year 2010 and Fiscal Year 2011, provided the MAPS 3 related Use Tax funds, which would be general funds, are available. a. This offer is dependent solely on Maps 3 passing; otherwise there would be no Use Tax funds available. Also, the offer of no layoffs would end on June 30th of 2011, even though the Use Tax revenue continues. We would be acknowledging that they can lay off firefighters below the number established by the 1989 public safety sales tax ballot. We suggested that they use the Use Tax as a funding source, but public safety would need virtually all of it to fix our staffing problems, and until another funding source is established, we would need the Use Tax during the entire Maps 3 initiative (7 years, 9 months). FYI: the Use Tax raised over 35 million dollars in fiscal year 08/09. C. The City will authorize the addition of 10 firefighters, and these positions will be authorized for Fiscal Year 2010 and Fiscal Year 2011. The Fire Department’s additional personnel will be funded only if Maps 3 related Use Tax funds are available. a. This offer is also dependent upon Maps 3 passing. We would only have the 10 additional personnel through June of 2011. The cost of this offer would be approximately $675,000. This is only a fraction of the Use Tax revenue. If they had offered to fund the Call Back system with Use Tax dollars we could have seriously considered the offer. 10 additional firefighters will not fix our staffing problems, and the additional personnel would have only been temporary. Final comments: I will supply all of our V.P.’s with copies of the offer from Jim Couch and the September 23rd offer. I want everyone to know why we rejected these offers. I believe you deserve to know the truth. As to the Mayor’s comments concerning how bad it will be for public safety if Maps 3 fails. 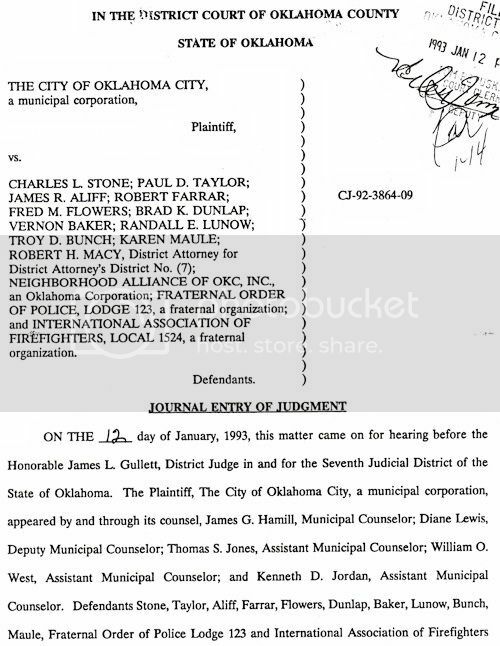 The city has always had the authority to "hire, suspend, or discharge any member of the Oklahoma City Fire Department subject to the laws existing during the tenure of the contract” (contract, Article 4.2). 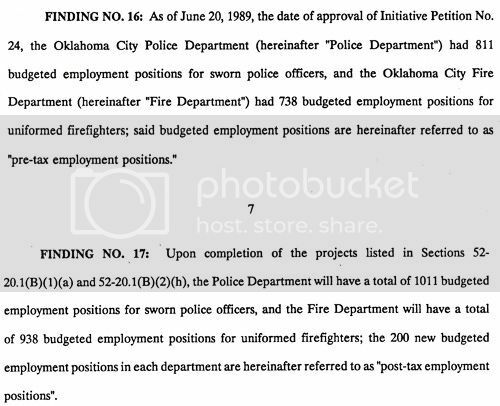 We have a law (a judgment) that currently says our city has to provide 200 additional firefighters over the staffing level that existed in 1989. Now they are saying they do not have to comply with that law. Our contract says otherwise. We will not stand for any cuts in personnel without a fight! We must stay strong, stay involved, and stay together. Solidarity and political involvement is what they fear the most. If you want to read the full ballot-associated city ordinance, click here. 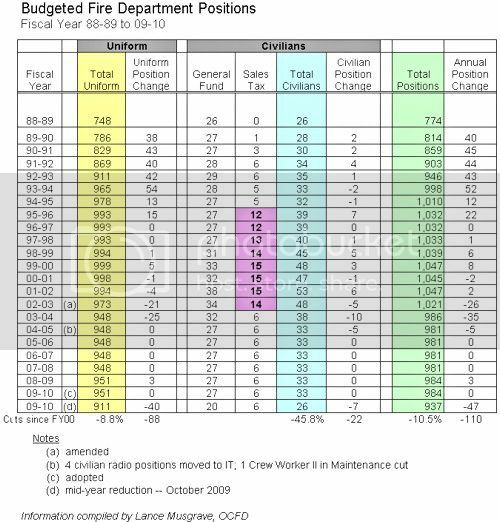 Firefighters Personnel 1989-FY 2009-2010. 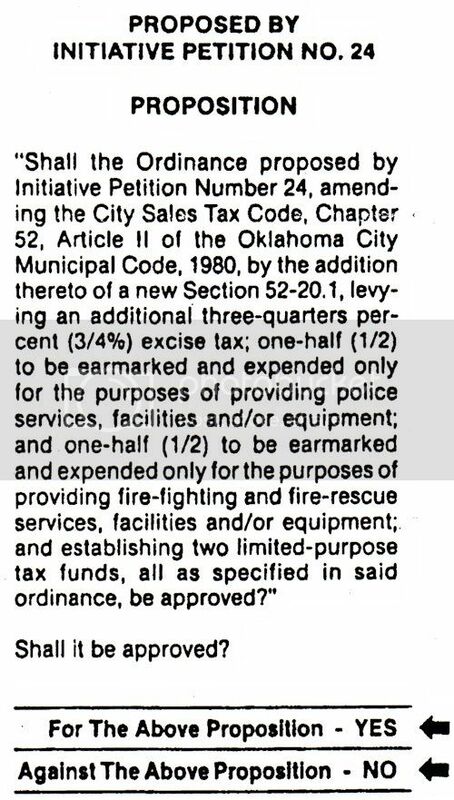 The number of firefighters established by the 1989 sales tax ordinance and as shown from the above excerpts of the 1993 journal entry of judgment is 948. When the city's hand was called about the blatant misuse of sales tax receipts to fund (the 2002-2003 fiscal year budget would have increased the number to 30), the number was reduced to 6 but the city's use of that money during the eight previous years was not recaptured or restored to its proper place. 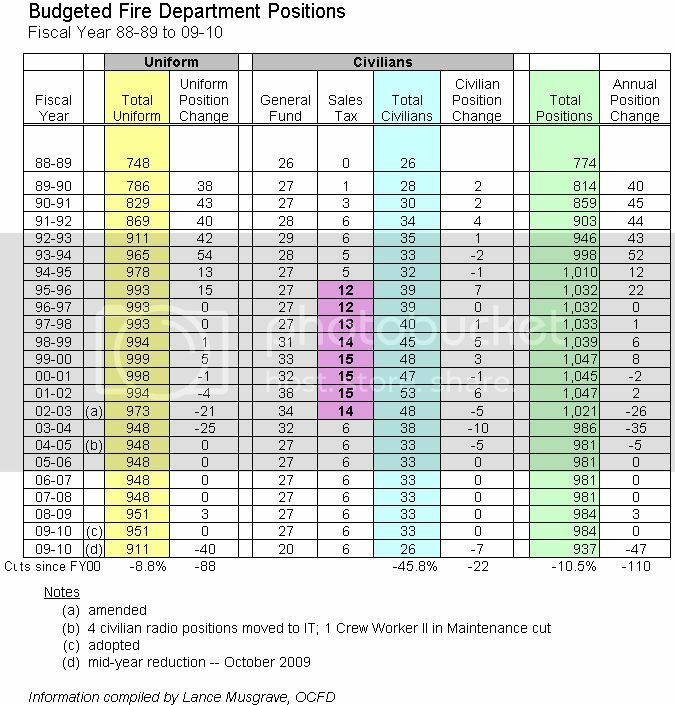 At the same time that the number of administrative staffing paid by the sales tax was cut back to six, the number of uniformed firefighters dropped from its 2002 level (994) to 973 in 2003, and has remained lower than that ever since. 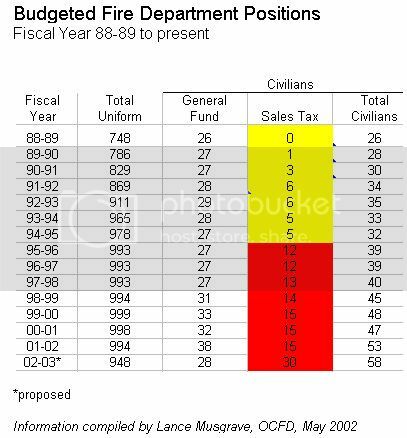 The city's budget for fiscal year 2009-2010 eliminates 40 uniformed firefighters, dropping the number to 911, the lowest it has been since 1993, and well below the 948 minimum established by the 1989 sales tax ordinance and 1993 journal entry of judgment. See the chart below. If my understanding is correct, boiling the above down to plain speech, the existing 6 rescue squads were reduced to 1 with the 5 discarded rescue vehicles being pastured and stripped for usable parts. One rescue squad = 4 personnel at 3 shifts -- 12 personnel altogether. 12 x 5 rescue units abandoned = 60 personnel. Those personnel would be reassigned "as staffing allows" during the phase-in of ALS engines over a 5-year period, but that still has not fully occurred. I'm not satisfied that I've got this part right and will modify this section later, as needed. This on-going article was first published on October 26 and is current through November 13, 2009. It will eventually be filled with articles beginning in mid-September with updates through December 9, the day after the election and perhaps a bit later. As each "Breaking News" item is added, I'll move this article to the top of blog articles, other than the Index item which always appears at the very top. One of the gripes that some have about MAPS 3 is that not a heck of a lot of news about it has been readily available. If, in fact, the Oklahoman were taking its principal (news reporting) function seriously, which thus far seems not to be the case, scarcely if any need would probably exist for a compendium of news like this one. In this regard, also see this article in Dustbury and this one at imaginativeamerica.com. 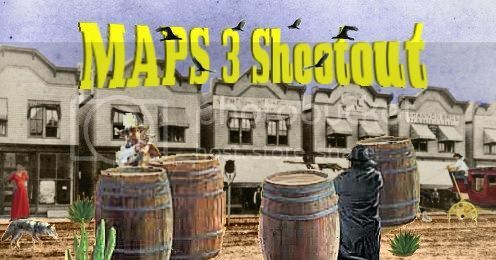 The purpose of this article is to assemble and disseminate ALL news that I can locate about MAPS 3 in one place — pro, con or neutral — so that it will all be either readable from here or clickable to outside links. It will include videos, newspaper articles, stuff from local television news. BREAKING NEWS! The Journal Record's Take on November 12 developments The day following the mayor's press conference on public safety, MAPS 3 and as relates to the city's still under-wraps offer to the police and firefighter unions, the Journal Record gave its report of the events. This news report will be eclipsed by news which will presumably come later today about union meetings held during the evening of November 12 and their respective responses to the offers from city hall. CHAMBER BREAKING THROUGH LUNCHEONS. Now that the Chamber's three "Breaking Through" Luncheons are done, I've reorganized those luncheons into this single area which is not mixed with the otherwise chronological news items here. Each of these luncheons brought in out-of-state speakers to address various facets of MAPS 3, and for each luncheon the audio is presented fully and saved for posterity. In each, MAPS 3 proponents put their best foot forward and in a wholly friendly environment, so the information presented here should be seen as altogether pro-MAPS 3. A person who is undecided about MAPS 3 might do well to listen to the audios and/or read the summaries provided below. The full videos of each luncheon are presently at the Chamber's YesMaps website. October 21: The first of three Breaking Through Luncheons. Unknown to me until after the event had occurred, a kick-off Breaking Through luncheon sponsored by the Greater Oklahoma City Chamber of Commerce occurred on October 21 at the Skirvin. Not widely publicized (it wasn't mentioned in the City's MAPS 3 website, it wasn't mentioned in the Chamber's MAPS 3 or regular website, and I've been unable to find any notices of the meeting in the Oklahoman's archives which predate October 22). A brief and not particularly informative article by Jesse Olivarez was in the October 22 Oklahoman. A streaming video presentation of the meeting was available to be seen at the Chamber's and the Oklahoman's NewsOK.com websites, but unless citizens were aware of the event and that the streaming video would occur, they would not have been able to see it as it unfolded. A video of the luncheon is, however, available for your viewing this area of the Chamber's website and is now also at Chamber's specific pro-MAPS 3 campaign website. The video is incapable of being embedded here, but I ripped the audio and put together modest slide shows, below, enough for you to get the flavor of how the speakers appeared. They are presented in the order of the conference though you can skip around if you want. I am in the process of adding of each speaker's comments and of the 22 minute Q & A session which ended the meeting. hand-held devices and tweet their friends to watch the video of the event which was being streamed to the Oklahoman's and Chamber's websites and introduced the speakers for the program: (1) Mayor Cornett who would discuss the convention center, improvements to the state fairgrounds and to the Oklahoma River; (2) Joe Jacobi, US gold medal winner in white water canoeing and acting executive director of USA Canoe/Kayak, to discuss the proposed white water facility; and (3) Teresa Dodson, manager of global accounts for HelmsBriscoe, a Houston based business specializing in helping groups with their convention meetings — planning and site selection. He said that a question and answer period would follow the speaker presentations. background of the city establishing a MAPS 3 website nearly three years ago in which a call for ideas which posed two questions: "One, would you like to see a list of initiatives for a MAPS 3 proposal that you can consider; and, two, if you would like to see it, what would you like to see on it?" he said. To question (1), he said 85% answered affirmatively, and, as to (2), 2,747 ideas were submitted. Of the top 14 vote getters, 12 are in MAPS or have already addressed in another initiative. He said, "This, to the purest level, is a citizen-led initiative," adding, "of course, we would have a citizen oversight board as we always have in the past." About the proposed convention center he said it has become an "incredibly large amount of our economy — two billion dollars is coming into Oklahoma County today, a year, as a result of our tourism budget. We have built a city that people want to visit. We haven't necessarily kept up with having a venue to visit, once they've been here," he said. "We've never really built a convention center, and I think that's one of the reasons we have a tough time communicating this largest project of MAPS is because when people think of a convention center in Oklahoma City they think of the Cox Convention Center where they go to watch sporting events. What we did was we built a sports arena, we put some big rooms around it, and called it our convention center. We've really under-served the convention center industry as a whole. When you start to think about the best way to improve your economy, economic development at its purest form, you're talking about a dollar that was earned somewhere else and then deposited in your community. That's the way it grows. And that's tourism in its most basic form. The opportunity that we have with the convention center will allow us to triple the business that we currently get from the convention business. Our current facility is smaller than Tulsa, smaller than Wichita, smaller than Omaha." He said that, although "We have a really site good picked out in the Core to Shore planning prospect — put it on the boulevard, next to the park. We're going to continue to revisit the site because this is a pretty big decision. I want to make sure that we have a strong consensus in the community that that's the best site. But the things to keep in mind are, where are the hotels, and where is Bricktown. Do not get too far away from either of those two entities." About the Oklahoma River, he said, "The fact that we used to mow it ... and now we row it ... is an extraordinary accomplishment." "We will build, if MAPS passes, the best rowing course in the world. This will be best rowing, canoe, and kayak venue, anywhere. And I don't have to tell you that if you have the best facility in the world the events are going to come." Mayor Cornett described the White Water facility as "an interactive, man-made, canoe/kayak facility that's not only for Olympic caliber athletes, it's also for you, me, and family." He said that the only real model in the United States is a facility in Charlotte, and a few video clips of that facility were shown. "But, this is the type of amenity that we've gotta continue to offer to our young people. If we're going to continue to attack our kids and our grand kids to live in Oklahoma City, we've gotta come up with some really cool stuff." The mayor then turned to facilities at the Oklahoma State Fair, and he described how successful the bond program which improved horse show facilities had been, to the extent that the horse show season has been extended to allow for more events. But, about other public facilities, he said, "Whenever I'm at the fairgrounds, I get nostalgic. You , know, I ... I ... I remember back when I was a kid. And there's a reason for that. It's because it looks just like it did when I was a kid. I mean, these buildings were built in 1950s and 1960s. And if you go out to the state fair or you go out there for a gun show or an arts and craft show or an antique show, you've seen these buildings. It's probably the most inclusive aspect of all of the MAPS projects in this initiative," he said. "So what we need to do in MAPS is improve the public facilities at the fairgrounds, what we use during the State Fair of Oklahoma, where we go when we go to an antiques show or an arts and craft show or a gun show," and he said, "MAPS will take care of that." share and be a part of — that part of our individual and collective psyches which speaks to our existing pride and self-esteem and an evocative call to enhance it even more. He gets Doug Dawgz blue ribbon for being the most effective speaker of the group. One cannot help but like this guy, particularly when coupling his talk with the remarks he made in the Q & A which followed the formal addresses. With a partner in his 2-member slalom kayak event, Jacobi won USA's 1st (and only) Olympics gold medal in kayaking at the Barcelona Olympics in 1992 and he was obviously gung-ho about his sport and completely humble while doing it. He also seemed genuinely gung-ho about what has already occurred in Oklahoma City and about that which might yet occur via MAPS 3. And his job was to sell those present on sharing his enthusiasm about all of the above. He did his job very well. Concerning the white water canoe/kayaking/rafting course, he said, "But, imagine, one day that that athlete is one of your own ... is a young person who's, right now, is in school in Oklahoma City who is developing the dream, 'Yes, I can go to the Olympics and I can stand up for my community and make them proud.'" About Oklahoma City's existing status, he said, "You know, one of my of my colleagues at the US Olympic Committee I was speaking to recently, and he told me, he said, 'If there's one bit of advice I give to you, enhance, build, and stay with that relationship with Oklahoma City.' That's the US Olympic Committee talking to us. Folks, you are on their radar screen. You are on the world's radar screen right now. We have an amazing opportunity to reach out and show a part of you and what you stand for to paddlists from all over the world." His focus, though, wasn't on those who live outside Oklahoma City. He said, "But, there's here more here, happening for you" . . . "I think the word 'connection' comes to mind. And I think we're talking a little bit of why I think this is going to be successful here." Although he talked about "physical connection," he wound up giving greater emphasis to a different element, what he described as the "emotional connection." About the "physical connection," Jacobi said, "People are going to be able to take a boat, a bike, walk, roller blade, to use alternative forms of transportation that just makes the journey to those areas more rewarding and more special. So, that physical connection is so important." About the "emotional connection," he said, "But, there's something else that is really important to me and why I think that this is so unique and that is the emotional connection to this" . . . "We need sanctuaries, we need places, not just on the river but around water. Water represents something that's very special and deep for us" . . . "I'm talking about you, the citizens of this community, the people that you work with, the people that you go to church with, your next door neighbors in your community." He equated the white water facilities as an example of something that has the capacity to make a difference in our lives. He said, "I'm so interested in people living the life that they really want to live and I know, first hand, the role that these kind of facilities will make in, in, the difference in your life." Turning to outsiders briefly, he said, "I think that the idea of an Olympic medal, the idea of athletes coming here . . . I'll show you exactly what they are coming here to train for. They are coming here for one of these, and this is the gold medal that I won at the Barcelona Olympic games in 1992. That's what these young guys are coming here for." But, once again, he turned the external to the internal and said, "The thing is, I know a thing or two about winning these. And, the thing is, they are not won once every four years. They are won every day. They are won every day doing the kind of things you are doing right here in Oklahoma City. And, specifically, that means, you guys are not scarred to be different and stand apart and do and set yourselves apart from people based on those differences. That is such an admirable trait in people. It's an admirable trait with businesses. And it is a really admirable trait in municipalities — when you will stand up and say, 'We want to be different, we want to be known, we want to be a part of something else, something better, something deeper, something that just resonates with who we are and what we stand for and what living well is all about.'" Her presentation focused upon a recent example in which she worked with an unidentified organization planning for a medium-sized 2010 national conference. The group wanted to meet somewhere in western United States. Oklahoma City was not one of the cities considered, and she explained why. Previously, the same organization had its annual conferences in "eastern" cities which she identified as New Orleans, St. Louis, Cincinnati, and Nashville. Prospective "western" cities considered, those on the "long list," were Chicago, Dallas/Ft. Worth, Austin, Denver, Salt Lake City, Seattle (but not seriously), and Anaheim. "And, as you can hear," she said, "Oklahoma City didn't make that list," although she added, "but with these products coming on line, Oklahoma City would be on that list. And I think that it's important to know is that how a city can grow if you get the right products in place." She described the organization's demographic needs as follows: "Just a little bit about this conference, so you can have some good idea about the numbers and the amount of revenue that it would generate. It is a 2 ½ day conference; it is 6-7000 attendees; 12,000 room nights with the peak room-night being 3,800 rooms; we view 30-40 break-out rooms; we will do some exhibits." She said that, "General economic development for that would be about $4 million dollars. That's just the attendees' spending the night and eating and doing some shopping," exclusive of other spending during the conference. "The things that you do are important, the activities that you participate in. Some of the things about the long list, which is the cities that we were considering, are important — you have to have the right venue to come; you have to have space; you have to have the right amount of space. The convention center that we would be using would need at least 200,000 square feet of meeting space — and that's not a great sized meeting." "The other things that take into consideration when you're looking at a city for a convention would be the 'short list,' which is what I talk about are having the rooms, having the right amount of space, but also having the things to do, and what's around that convention center, and again, it sounds like with this MAPS plan that you are on the right track with those types of products. When a convention person is in town — they wanna . . . and this group had a lot of free time on their hands, so they want to dine out, they want to go to the attractions, they want to shop — and all those things those things you see with the new MAPS plan would really promote that." She said that her company, HelmsBriscoe, is always looking at new sites and said she would be glad to promote Oklahoma City. October 29: The 2nd of 3 Chamber Breaking Through Luncheons. This 2nd Breaking Through Chamber luncheon occurred on October 29 at the Petroleum Club. Notably, the occasion marks the 1st instance in October that the Oklahoman designated one of its first-line reporters, Steve Lackmeyer, to cover ANY MAPS 3 news event. The next day, a Lackmeyer-written article describing the event was also printed in the Oklahoman — see the October 30 item in the chronological news area. Might it be that the phrase "Breaking Through" has a greater meaning than merely being a catchy name for the Chamber's 3 major MAPS 3 presentations? The sole topic of this luncheon was the Central Park element of MAPS 3. Unlike the 1st Breaking Though luncheon at which the master of ceremonies was David Thompson, president of the OPUBCO Communications Group (which, of course, owns the Oklahoman), on this occasion the master of ceremonies was Roy Williams, Chief Executive Officer of the Greater OKC Chamber. Earlier, Williams (in this writer's opinion a wholly classy guy) more than ably led the Chamber's wildly successful March 4 Ford Center campaign. To me, at least, this was a refreshing and hopefully not just a coincidental development — but, even more hopefully, may also represent a harbinger of things to come. See this article for more about that. Like the 1st Breaking Through luncheon, the event was video streamed to the Oklahoman and Chamber websites. The full video can be viewed at the latter link but you'll have to wait through about 25 minutes of eating time to get to the actual presentations. I've again ripped the audio portions from the streaming video so that you can skip right to the speaker presentations. Modest slide-show animations accompany the audio so that you will get some visual idea of the speakers during their presentations. You can listen/view chronologically or skip around, as you prefer. No summaries are done as yet though they will be, shortly. The Park — 29:58In this slide show, back/forward navigation buttons are available since the graphic images rarely match the sequence of Ms. Jones' remarks. Using those buttons does not affect the audio flow, except that if you prematurely navigate to the last slide audio will stop and you will have to start over to hear any part that you may have missed. Question 1: Oklahoman reporter Steve Lackmeyer noted the existence of plans for a new ice rink in the new Myriad Gardens plans as well as in Central Park. How much coordination is going on over there, how do you see that working ...?" Question 2: The second question inquired about studies, parks, in other cities about security issues and measures. 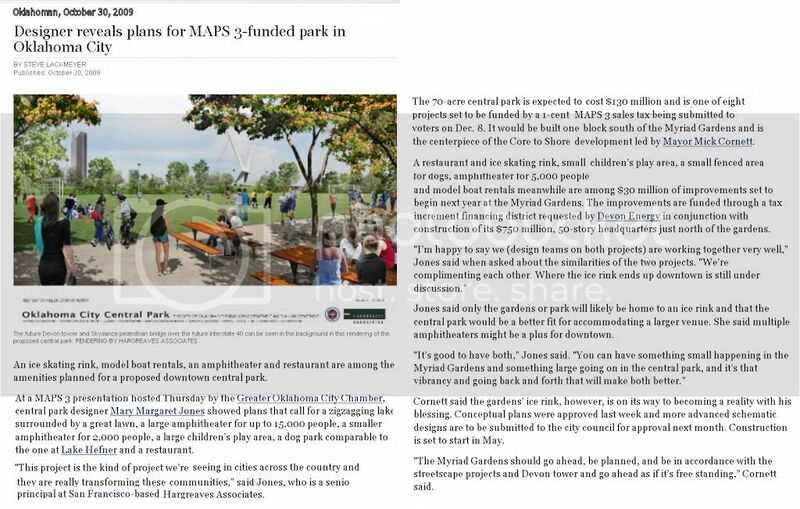 Ms. Jones: "There's nothing that makes a downtown feel safer than people, and so there's nothing to help that better than an active park full of people. What we do is outline a security program ... First of all, you have to design it so you can see. You know, that's one of the most important things is to not set up a park that has hedges and, you know, lots of sort of visual barriers. You want trees, and you want some land forms, but you also need to be able to see. So, that's the first thing. In Discovery Green, they have a security force that is part of the staffing of the park itself, and then they also use off-duty policemen who come like for the Thursday night concerts. There's always somebody there on a bicycle, typically, but there's always security there. You need your park offices in the park, you need your cafes, you need activity. As long as you have that you're fine." Question 3: After a lengthy introduction, the 3rd questioner asked about planning for the funding, the financing, of security and what thought had been given to that. Ms. Jones: "Absolutely. The budget we are helping the city come to would be a budget that would include maintenance, that would include security, and that would include the staff that you need to program the park. And then we're looking at the various ways of funding that budget. But that budget includes all of those. The funding of that budget on a yearly basis would probably be some combination, like most parks are, of fund-raising, city funding, and the income generated by the facilities in the park itself. It has to be thought of up front. Has to be part of the plan for the park." Question 4: What about parking and access? The mayor said to Mary Margaret, "Do you want to address the parking?" but he changed course and gave his comments first. He said, "We ... we ... we don't at this point know exactly what the parking needs are going to be and we're willing to address them as the time comes. At one time, we thought about putting parking underneath the park as is done in Chicago's Millennium Park. But the cost was so expensive, that we realized we can probably spend our parking dollars better of somewhere else. But until we start dealing with the private sector on the edges and try [?] to see how the park is going to be incorporated in the other land use that's around it, it's probably presumptuous of us today to say today exactly where the parking needs are going to be. But when you think about a park in general, you're probably talking about its high-use times are on weekends when downtown parking is typically available. Similar to the Ford Center, we don't hold games at 2 o'clock on a Monday afternoon but if we did it'd be hard to park for an NBA game. And, so, I think one of the ideals is, you want to maximize your parking at all times and a park actually helps complement the parking flow with the business community that is already enacted [?] in the parking area [?]." 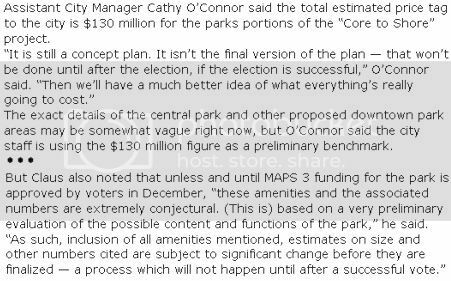 Ms. Jones, added, "I'll just add to that the amount of street parking that we can get surrounding the park is a lot. And the street parking around the park is actually a good thing. It gives people a place to park with their picnic baskets and their kids right adjacent to where they want to be. It also gives you a kind of safety buffer if a kid runs out of the park chasing a ball. If they run through first a kind of buffer of parked cars before they end up in a street of moving car, that's a good urban design measure. So there's hundreds of parking spaces right around on the surface streets. There also sites for structures that can be right adjacent to the park. As the mayor said, it didn't seem like you guys were so land-strapped that you had to put a parking garage below the park." Question5: Has much study done on the interest in businesses or residential complexes building around parks like this and what kind of revenue that would produce? "In other cities, absolutely. That's what my slide was about in terms of return on the investment that other cities have seen. We're putting that report together for city staff, but there are great examples. It's an enormous return on investment. The value of residences adjacent to parks is 6 to 10 times higher. The value of development adjacent to parks is measurable, we can actually measure that. We can measure the private investment in these other cities in relation to the public investment and it's always 4 to 10 times what the public investment is." After a closing joke by the mayor and thank you's, Roy Williams announced that the next Chamber Breaking Through luncheon wold be Monday, November 16, and that the topics would be trails, sidewalks, transit system, and wellness centers, and, in the latter regard, that Mayor Patrick Hays of North Little Rock will be the featured speaker. November 16: The 3rd of 3 Chamber Breaking Through Luncheons. This 3rd Breaking Through Chamber luncheon occurred on November 16 at the Petroleum Club. Roy Williams, Chamber CEO, was the master of ceremonies and presentations were made by Mayor Cornett and Patrick Hayes, 21-year mayor of North Little Rock, Arkansas. Like the 2 earlier Chamber luncheons, a Q&A session followed the speaker presentations. I've ripped the sound from the on-line streaming video sessions for use in the files below, but if you want to see the full video presentations, they are presently available in the "Video Center" area of the Chamber's YesForMaps website. Master of ceremonies Roy Williams, CEO of the Greater Oklahoma City Chamber of Commerce, briefly introduced the program and speakers, Mayors Cornett and Hays. Mayor Cornett's presentation focused on the downtown streetcar project, bicycle trails, and sidewalks. There are no slides, only audio, below. It would include 5-6 miles making it, he said, the largest such project in the United States. He said that the project "is a very impressive system we've designed," but no particulars about that design, if it exists, were given, other than to say that it would be a spoke-and-hub type, generally. A 3-year-old metro transit study contemplated that a similar project would be a "loop" type, but "that was a mistake," he said, "making it more like a ride." Instead, its function should be to get people where they want to go and that a spoke-type with lines running to and from a multi-modal hub would be better suited for that purpose. The hub, he said, would likely be located near the north/south Santa Fe tracks and depot and would allow room for expansion. Mayor Cornett then turned to bicycle trails and the city's bicycle trails master plan. He said that it was a great plan but that it was taking much too long to be completed at the present pace. This element of MAPS 3, he said, would substantially complete the plan by adding more than 50 miles of bicycle trails which, when connected with other metro area cities' trails, would be an overall bicycle trail system over 200 miles in length. He briefly addressed the sidewalk component, largely in suburban areas where public buildings, e.g., schools and libraries, have been built but without pedestrian sidewalks to get to and from them. This element of MAPS 3 includes 75 miles of sidewalks, he said. Mayor Cornett then turned to senior centers, made a few prefatory remarks, and then introduced Patrick Hays, 21-year mayor of North Little Rock who was the principal speaker in this Chamber luncheon. Patrick Hays, 21-year mayor of North Little Rock, was the principal speaker. He described that city's senior wellness and aquatic center which was initially funded by a permanent penny sales tax in 2000 and opened in 2002. The initial facility was 38,000 square feet at a cost of 5 million but it was so popular that another 22,000 square feet was added by another vote of the people, also costing $5 million. So, at present, the capital improvement cost has been $10 million. forward buttons are also available. 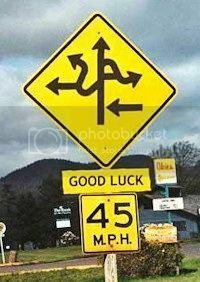 Feel free to navigate if you want. In North Little Rock, voters decided by a 53% vote to add a permanent sales tax to build the facility, 1/2¢ for the capital improvement and 1/2¢ for operation expense. After passage of the vote, the city's seniors were canvased to find out what they wanted they wanted in the facility and the item receiving highest demand was a full-sized Olympic pool, which was $1 million of the initial $5 million cost. The mayor's initial skepticism about this item was totally dashed -- the pool has been very popular. He said that the only problem was water temperature -- people who wanted to do laps wanted a cooler temperature and other users wanted warmer -- the solution was to build a 2nd pool, a lap pool, in an expansion of the facility. People aged 50 or more years qualify for membership. In the 7 years since the facility has been opened, 15,000 became members with about 5,000 active members. He said that the facility has the highest use rate of any such center in the country with about 700 using the facility each day. The mayor's presentation consisted largely of slides showing various rooms in the facility, including the following: puzzle room; aquatic pool; lap pool; walking trails; exercise rooms with lots of state of the art equipment; visiting areas where people just chat and "decide the problems of the world"; a pool room with 4 pool tables; a ping pong room; classroom areas; a small library; a computer room donated by AT&T at a cost of $50,000; and ballroom which can be rented. He said that about 1/3 of the center's operational costs are generated from rental, presumably during off-hours. Mayor Hays' presentation included several anecdotes of people coming up to him and telling him how much the center has added to their quality of life. One was by a gentleman who told the mayor that he had 2 girlfriends. He was 91, and he told the mayor that one of the ladies was going to "win out" because she could drive at night. That brought a good laugh from the audience, and from me. As I said, the mayor's slide show told his tale better than words. You can see most of those slides in the slide show at the upper right. The mayors took questions and Mayor Cornett added some additional remarks. Mayor Hays was asked about parking. He said that since the facility was built on land already owned by the city, parking was not a problem, and he also emphasized that a good transit system was in place for those wanting to get the center via the same. He was asked about how much the city subsidized the center. He said that the city wanted to keep membership costs low and that two membership forms are available: general membership, $25/year; extended membership (which he did not describe), $130/year. He said that about 1/3 of operation costs ($300,000) are paid by extended memberships and rentals and that about 2/3 ($600,000) are paid by the city. He did not mention it here, but remember that he said that 1/2 of the penny sales tax was earmarked for operational costs. Mayor Cornett added that the city might partner with the YMCA and/or universities in operations, but he noted that no YMCA was present between downtown and Earlywine (roughly, west of May Avenue around SW 115th) and that part of the location decision would be based upon need, areas not presently served. Mayor Cornett took a few questions on other topics. About what is planned for the Cox Convention Center, he said that its potential use is undetermined and that it is premature to decide. He noted that the new convention center would not be open for 10 years, 9 at the earliest, and that even then convention needs might exist for Cox for a few years after that. 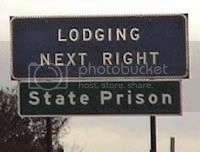 Eventually, he said, the property would be appropriate for a "really terrific" use. He was asked about the location of the bicycle trails. He described the general location of existing trails -- up MacArthur to Lake Hefner, cutting across to Wilshire and into Wiley Post airport and then generally following the canal between Lake Hefner and Lake Overholser. Ultimately, he said the plan is to connect the Oklahoma River to Lake Overholser, which would, of course, connect to the existing trails along the Oklahoma River. The mayor was asked about a timetable. He responded by saying that projects don't get done until money is collected, but, that said, the first priority is central park. He noted that I-40 relocation is scheduled for completion in 2012 at which time the old I-40 would be destroyed to make way for the new boulevard which he said should be completed in 2015. He said that the park should be open to coincide with these events, about 5 years from now, but that perhaps other elements, e.g., trails, could also be worked on during the same time. He implied that part of the problem is identifying what construction costs would be in the future. While revenue stream is fairly predictable, he said, construction costs are not. We all need to work together on this. We have tried and continue to work with all of our employee groups and with all our citizens who have made this city work -- what has put us in an enviable financial position is unity. And now is no time time to start splintering off. This ends the Chamber's "Breaking Through" luncheons area and what follows is MAPS 3 news presented chronologically. SEPTEMBER NEWS. On September 17, the MAPS 3 public announcement was made by Mayor Cornett, flanked by council members Gary Marrs (Ward 1), Pete White (Ward 4), Skip Kelley (Ward 7), Meg Salyer (Ward 6), and Sam Bowman (Ward 2) and with letters of support from council members Larry McAtee (Ward 3) and Patrick Ryan (Ward 8). Only J. Brian Walters (Ward 5) was not present and later expressed his opposition (even to the extent of being unwilling to submit the matter to a vote of the people). The proposal was put before the City Council on September 22, and on September 29, the proposal was approved to be put to public vote on December 8. This "September" news section begins on September 22. September 22: News9/Oklahoma Gazette Poll. On the same date as the proposal being put before Council, the results of a scientific poll sponsored by News9 and the Oklahoma Gazette were released. The Gazette's article by Scott Cooper is here the PDF file containing the full poll and results is here. Among many other things, the poll showed that a minor majority favored extending the sales tax but also that more than 80 percent of those polled said they did not have sufficient project information to make a final decision of support or opposition for MAPS 3. September 30: Campaign to Inform the Public. In this Gazette article by Scott Cooper, covered the mayor's thoughts about the need to educate the public and a bit about doing that. September 30: Council Sets Vote. 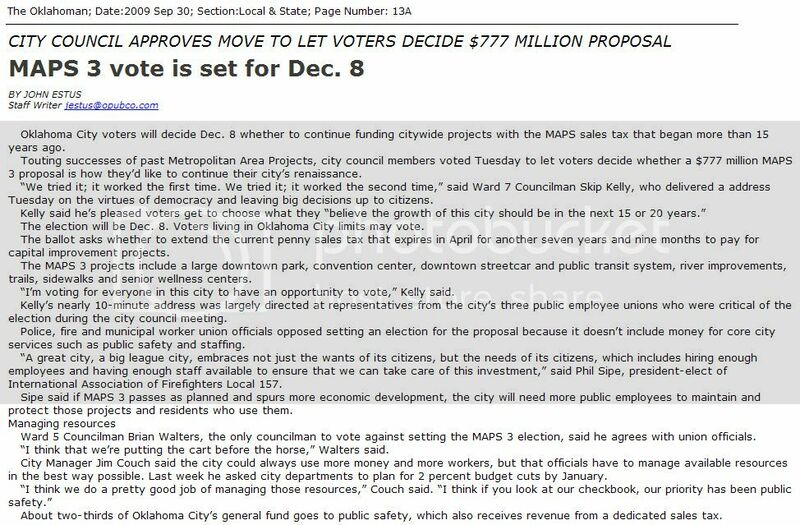 In an article by John Estes, the Oklahoman reported on the September 29 City Council decision to put MAPS 3 to a vote. It is the last decent Oklahoman article to have been written so far (as of this date, October 27). OCTOBER NEWS. From October 1 through October 20, the silence was deafening. On October 20, a piece appeared on KOCO-TV news discussing police response time in emergencies which, according to an internal manpower study (by OCPD, I guess), was significantly below Edmond and Norman. In the print media, one article appeared in the Oklahoma Gazette and that is all. But, as this update is written, October is finally picking up, but not in the Oklahoman. Hmmmm ... "* * * if the election is successful," O'Connor said. "Then we'll have a much better idea of what everything's going to cost." "The amenities and the associated numbers are extremely conjectural." Like it or not, then, the numbers stated by the city may well be "extremely conjectural." Fine, if that's so — but voters have need to know just how speculative the promised parts of the $777 million proposal are. Catchy quotable quotes by our city officials, they are. This is particularly interesting since the city already paid $500,000 + for an outfit in San Francisco to come up with the existing plan. OKLAHOMA CITY — As the vote on MAPS 3 draws near there is more and more talk about what it will mean for the city. However, not everyone is excited about the plan. In fact, two prominent local groups are coming out against the plan. At their meetings this month, members of the International Association of Firefighters Local #157 and the Fraternal Order of Police voted unanimously to oppose MAPS 3. ¶ Both groups agree previous MAPS projects have done great things for the city. ¶ They also say they are not necessarily against the projects within MAPS 3; they simply feel in the past MAPS has not delivered what was promised. Phil Sipe, local president of the IAF, says, "The promise it was going to provide the economic tax and revenue base, we feel, has not been fulfilled." ¶ He says since 2002, 50 firefighter positions have been cut. ¶ A spokesman for the FOP says a public study recently found the city needs nearly 200 more police officers to adequately cover the city, with the amount of growth it's seen. The mayor says these groups are implying that public safety is not important; he says that is wrong. ¶ OKC Mayor Mick Cornett says, "This community should be offended by any implication that public safety is not important because it absolutely is." Regardless, these two groups feel MAPS is leaving them behind. Sipe says, "Growth in the city, we feel, can't be one sided. It can't just be about economic development; you also have to address the issue of how are you going to take care of that growth." ¶ Sipe says local firefighters have offered to give their raises back in order to fund more positions, but they say that option was denied by the city. The vote of MAPS 3 is scheduled for December 8, 2009. October 23 Interview of Joe Jacobi. In town for the Chamber's Breaking Through luncheon on October 21, Olympic Gold Medal winner Joe Jacobi discusses the white water elements of MAPS 3 in this interview by Angi Bruss. But political science experts said they’re not certain that a large turnout will necessarily be good for passage of the $777 million issue. In September, Oklahoma City Council members voted to set a special election for the public to decide whether to continue a 1-cent, limited-use sales tax for seven years to support a package of major infrastructure and facility improvements, dubbed MAPS 3. ¶ The first MAPS, or Metropolitan Area Projects, was passed in 1993 and included projects such as construction of the Bricktown Ballpark, renovation of the Cox Business Services Convention Center, and development of the Oklahoma River. The second issue in 2001, MAPS for Kids, focused on the Oklahoma City Public Schools District with new buildings and technology upgrades. If passed, MAPS 3 will provide for the creation of a 70-acre park downtown, a fixed-rail streetcar system and new convention center downtown, trails and sidewalks throughout the city, state fairgrounds improvements, wellness aquatic centers for senior citizens, and upgrades to facilities at the Oklahoma River at the heart of the metro area. The first MAPS was passed with the support of 53.8 percent of about 60,000 voters, Oklahoma County Election Board records show. The follow-up MAPS for Kids issue passed with about 61-percent support, but the question was divided into two portions – 60,000 ballots were cast for the municipal components and about 34,000 ballots were cast for school district components. In early 2008, city officials proposed a penny tax worth $120 million to upgrade the Ford Center arena in downtown in order to lure an NBA team. Arena improvements were originally intended to be part of a larger MAPS package, officials said at the time, but had to be moved forward because of NBA board of directors’ voting priorities. That issue passed with the support of 61.9 percent of about 74,400 voters. Keith Gaddie, a professor in the political science department at the University of Oklahoma, said the MAPS 3 vote has an inherent component that will likely keep numbers down: scheduling. The election takes place shortly after Thanksgiving when people start getting busy for winter holidays and thinking about buying Christmas gifts. Small voter turnouts generally benefit passionate supporters, he said, because indifferent voters just won’t bother. ¶ “But the downside is that in a low-turnout election, it’s also a lot easier for an intense opposition group to get organized and get their vote out together,” Gaddie said. At Oklahoma City University, political science department chairman Richard Johnson said the MAPS 3 campaign needs to do a better job of informing constituents. 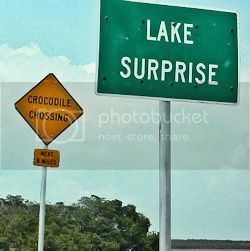 ¶ “Unless the supporters do a better job of getting out in front of this, they really risk having it fail,” Johnson said. ¶ “People have felt really good about the MAPS projects generally and getting a reasonable return on their dollar. But there’s not really enough out there yet. The public really needs to be educated about MAPS 3 and what’s in it – something like the need for an expansion of the Civic Center, for example. The benefits really need to be laid out for people to motivate them to vote.” ¶ He agreed with Gaddie: “There will be some people who are anti-tax no matter what,” Johnson said. October 30: Breaking Through ? — an Oklahoman Article on Breaking Through. Not since John Estes' September 30 article which described the Council's decision to place MAPS 3 on the ballot had the Oklahoman deigned to publish a substantive article on MAPS 3, certainly none by one its front-line reporters. After that, by all appearances MAPS 3 was "hands off" for the Oklahoman's front-line journalists. After a month's hiatus in avoiding reporting upon MAPS 3 in a critical sense, i.e., thoroughly and analytically, on October 29, the Oklahoman authorized Steve Lackmeyer, its well-known and well-respected business writer, to attend the above October 29 luncheon and to write about it in the October 30 edition. Click here to read the article, "Designer reveals plans for MAPS 3-funded park in Oklahoma City." The article itself isn't particularly lengthy but does point out that both the plans for a revamped Myriad Gardens and the tentative plan for Central Park include provision for an ice rink, a possible inconsistency, and Lackmeyer inquired about that during the Q & A session of the Chamber luncheon. The content of the written article is expanded upon in Lackmeyer's October 30 OkcCentral.com blog post on the same topic. In the grand scheme of things, the apparent duplication of an ice rink is a relatively small matter even if a good reporter would notice the fact and would inquire about it. That's what good reporters do. But, until October 29, no Oklahoman reporters were on the job to even make such innoxious inquiries much less any more serious probing around about other MAPS 3 issues. So, the much larger matter is that the Oklahoman authorized Lackmeyer to attend and report on the MAPS 3 presentations in the first place. 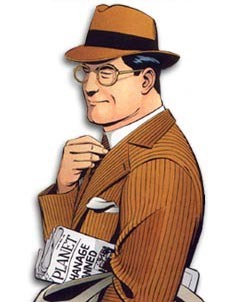 The long days and weeks of grief and mourning have been hard to endure ... rendered powerless by a blast of Kryptonite from the dastardly Lex Luthor, Daily Planet reporters were but vestiges of their former selves — morale was in the toilet. But, in what some observers see as a dramatic 180 degree turnaround of events, on the morning of October 29 within the cloistered and security protected walls of its fortress on the Broadway Extension in Oklahoma City, the Daily Planet, which had previously forbidden serious news gathering and reporting by its reporters on matters which might be seen as critical of MAPS 3, instructed Clark Kent, one of its most established and well respected journalists, to attend a Breaking Through luncheon sponsored by the Greater Oklahoma City Chamber of Commerce at the Petroleum Club in downtown Oklahoma City and to prepare a report for publication the next day. All kidding aside, do these developments represent a breaking through the Oklahoman's no-MAPS 3 reporting barrier? Hopefully, they do, but only time will tell. At least, the article represents a start, and I commend those within the Oklahoman organization who allowed it it happen. Such persons are deserving of a gold star, a purple heart, or something along those lines. NOVEMBER NEWS. 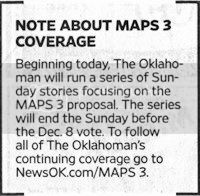 If a change might be in the air for the Oklahoman's news coverage about MAPS 3, such a change was not evident on November 3 when the Oklahoman was scooped by the Oklahoma Journal with the lead November story below. Journal Record, November 3: Not This MAPS Coalition. A November 3 Journal Record article by Brian Brus reported that on November 2 a formally organized political committee, the Not This MAPS Coalition, filed paperwork with the Oklahoma City Clerk. OKLAHOMA CITY – The upcoming MAPS 3 tax issue election has drawn formal opposition with the filing of a political committee, Not This MAPS Coalition, with the Oklahoma City clerk’s office. The group is opposing the $777 million, seven-year, penny sales tax issue mainly because of what the package of capital improvement projects doesn’t have: more emergency response personnel, said Phil Sipe, president-elect of the International Association of Firefighters Local 157 and chairman of the coalition. Not This Maps Coalition otherwise supports MAPS 3. But if the issue is passed by voters Dec. 8, he said, the likelihood of securing additional funding to hire firefighters and police officers any time in the next several years severely decreases. So the group is trying to convince city leaders to postpone the question to allow for more consideration. The first MAPS, or Metropolitan Area Projects, was passed in 1993 and included projects such as construction of the Bricktown Ballpark, renovation of the Cox Business Services Convention Center and development of the Oklahoma River. The second issue in 2001, MAPS for Kids, focused on the Oklahoma City Public Schools District with new buildings and technology upgrades. ¶ If passed, MAPS 3 will provide for the creation of a 70-acre park downtown, a fixed-rail streetcar system and new convention center downtown, trails and sidewalks throughout the city, state fairgrounds improvements, wellness aquatic centers for senior citizens, and upgrades to facilities at the Oklahoma River at the heart of the metro area. The anti-MAPS 3 group is countered by only one other formal filing with the clerk’s office: the Yes For MAPS Coalition, headed by Mayor Mick Cornett as chairman and former Mayors Kirk Humphreys and Ron Norick as co-treasurers. The Greater Oklahoma City Chamber is providing the main support for MAPS 3. The MAPS 3 opposition group maintains that the city doesn’t have enough police officers and firefighters, and personnel resources would be further stretched. The group’s vice chairman is Gil Hensley, president of the Fraternal Order of Police Lodge 123, who spoke out with Sipe against MAPS 3 at City Hall when the issue was first announced. ¶ Sipe said Not This MAPS Coalition wants the ballot changed to include emergency services funding. But Oklahoma County Election Board Secretary Doug Sanderson said that once the municipal government submitted its resolution, the text of the question was set. The change deadline was Oct. 8. It is, however, possible to call off the election, Sanderson said. City officials could cancel the issue at any time up to the scheduled election date, although the investment in ballots and personnel would still have to be paid. Sipe said his group is not trying to leverage MAPS 3 opposition for emergency workers’ pay increases. The firefighters union earlier this year said it was willing to give up raises this year if the city would hire more people or otherwise fill scheduling holes. Ultimately, arbitrators sided with the union and firefighters got their pay increased. ¶ “It’s never been about the money,” he said. Whether in favor or opposed, those with a stake in the Dec. 8 MAPS 3 bond [ed note: wrong ... it is a sales tax election, not a bond election] election must walk a fine line between official duties and political activism. Mayor Mick Cornett serves as an elected official who represents all of Oklahoma City's residents and the chairman of the pro-MAPS 3 campaign committee. Phil Sipe, the chairman of the Not This MAPS Coalition, is on the city's payroll and a union official. On one hand, city policy forbids the use of public funds, property and personnel for political advocacy. On the other hand, "being mayor is a 24/7 deal," Cornett said. ¶ "I have to do what's in the city's best interest, and doing everything I can to help MAPS 3 pass is in the city's best interest," he said. ¶ At the top of the city's most recently published informational flyer about the $777 million MAPS 3 tax issue, Cornett is quoted: "MAPS is about creating jobs, improving our quality of life and continuing our momentum." Those words were chosen carefully, said Kristy Yager, the head of the city's public information office. The phrasing does not inherently advocate a vote in favor of MAPS 3, because if the issue passed it would, indeed, continue the momentum of a penny sales tax otherwise set to expire and it would create jobs - at least during construction. And few would argue that a new park, fixed-rail transit system, sidewalks, convention center, trails and senior wellness centers would not improve the quality of life. The rest of the flyer outlines specific details of MAPS 3, without bias. The first MAPS project in 1993 set a penny sales tax for about five years to raise money for projects such as building the Ford Center, Bricktown Ballpark and the Ronald J. Norick Downtown Library. The second issue, dubbed MAPS for Kids, focused on local school improvements, mainly rebuilding or renovating all 75 buildings in the Oklahoma City Public Schools District. If MAPS 3 is approved with a citywide public vote Dec. 8, the sales tax collections will begin April 1, 2010, the day after the end of the sports facilities sales tax that voters approved in March 2008. The Oklahoma Gazette, November 4: The Downtown Rail Initiative. 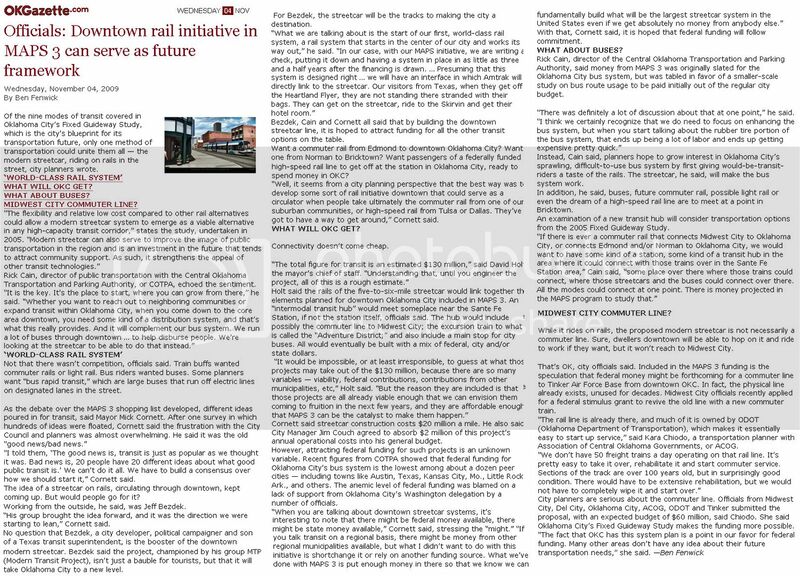 In a very nice article by Ben Fenwick with the headline, "Officials: Downtown rail initiative in MAPS 3 can serve as future framework," a brief history and the potential of both MAPS 3's downtown modern streetcar and the potentials beyond that are nicely covered. You can read the article at the Gazette's website here, or you can read a more printable version here. The November 4 article is actually the 2nd major Gazette article on the "modern streetcar" and MAPS 3 -- the 1st was done in a July 22 article by Fenwick and Rob Collins ... pair up the articles and an excellent resource is presented by the Gazette ... much much more information than exists from any other media source. I'm not getting into the July 22 article except to mention it since the sequence of this "All The News About MAPS 3" column begins in September. At this point leading to the December 8 election, the Oklahoma Gazette, in my estimation, is winning the prize for the most regular and thorough reporting on MAPS 3, even though it is only a weekly. Hats off to you, Gazette guys and gals! The November 4 article begins with a discussion of Oklahoma City's Fixed Guideway Study ... I'm not sure this is the same thing as the lengthy ACOG (Association of Central Oklahoma Governments) study published in 2006, but I think that it is -- I'm certainly not aware of another such study. Some discussion of the ACOG study previously occurred in this blog's Core To Shore article here. Beyond that, Fenwick's article contains interviews with Rick Cain, COTPA's director of public transportation, Mayor Cornett, Jeff Bezdek, a principal in the "Modern Transit Project" (MTP) and an avid promoter of modern streetcar development, Kara Chiodo with ACOG, and David Holt, the mayor's Chief of Staff who was previously described here concerning the elements in the MAPS 3 proposal. You'll find no pat answers in the article -- there aren't any. But you'll find lots of food for thought. November 6, the Oklahoman: City Manager To Meet With Firefighters Union Representative. In an article titled, "Meeting Set to discuss Oklahoma City firefighters' raises," reporter John Estus reports that a meeting between City Manager Jim Couch and Firefighter's Union president Phil Sipe would occur today, November 6. 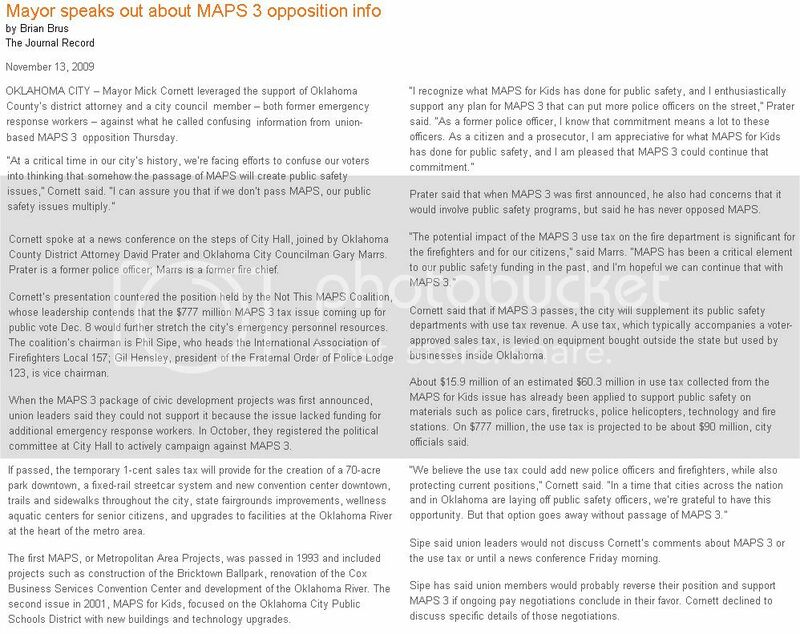 Although the article incredibly contains no reference whatever to MAPS 3, since the Firefighters are half of the "Not THIS Maps" organization formed to oppose MAPS 3 (the local Fraternal Order of Police being the other), the significance of the meeting could well have a profound impact on MAPS 3. If Firefighters' issues with the city are at least partially resolved in today's meeting or in others which it may spawn, the Firefighters could conceivably withdraw from the anti-MAPS 3 coalition or at least the zeal of its opposition to MAPS 3 could be diminished. In some of his remarks about the police and firefighter unions' opposition, the mayor has sometimes trivialized their opposition as being merely about wage increases even though other information quite clearly demonstrates that the opposition is based upon staffing issues which MAPS 3 does not address. In my estimation, the mayor would have been better served by taking the higher ground, discussing those issues straightforwardly, instead of being dismissive of the unions' non-wage serious concerns. Whether a logical linkage between MAPS 3, which focuses on capital improvements, and the unions' issues which focus on a need for more personnel, (i.e., one wouldn't expect that permanent staffing needs of city employees would be appropriately covered in a temporary sales tax package) is not considered here. But, as a practical matter, since the anti-MAPS 3 coalition is attempting to make that linkage, it is obviously MAPS 3 newsworthy. 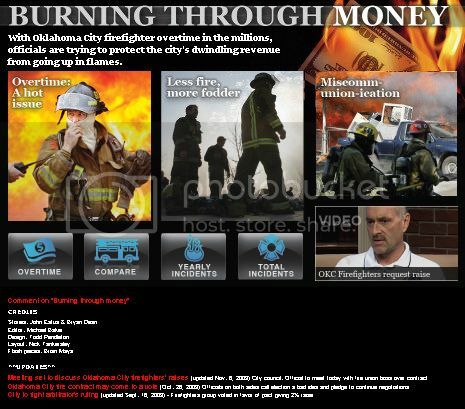 NewsOK.com maintains this area at its website which specifically focuses on the firefighter's issues with the city. Click the last stated link or the graphic below to go there and see for yourself. If you watched the above video, you know that the firefighters are more interested in staffing additional fire fighters than they are about salary increases. So, while the November 6 article makes no mention of MAPS 3, only a blindfolded horse would fail to see the relevant connection. To read the Oklahoman article, click here. As I said, don't look for the phrase "MAPS 3" in the article -- that wouldn't have been allowed by the Oklahoman's powers that be. But one doesn't need to see the phrase to comprehend its possible relevance to MAPS 3. Geez, a series of articles running all the way through the Sunday (December 6) before the election (December 8). Is the Oklahoman about to become a real newspaper in its reporting of MAPS 3? Sad to say, if the November 8 Oklahoman serves as an example of what to expect from the Oklahoman during the next 4 weeks, the answer is, "No. 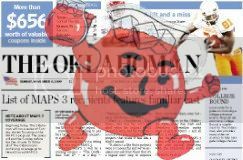 All we're going to get from the Oklahoman is Kool-Aid." Don't take my word for it -- read the articles yourself -- but don't look for any hard-hitting, look-under-the-corners-of-the-rug articles no such questions and/or answers. No such questions were asked or answered in any of the 8 articles in the November 8 Oklahoman. All articles, in my opinion, merely advanced the pro-MAPS 3 position and did not look closely at anything to the contrary. Article 1: Front Page. 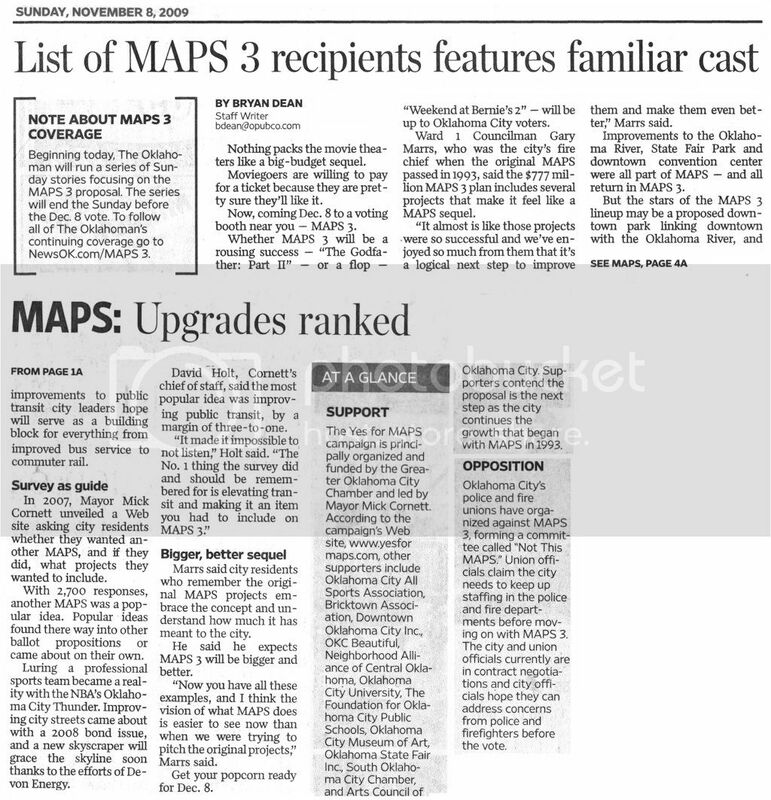 The lead article on the front page is by Bryan Dean and has the headline, "List of MAPS 3 recipients features familiar cast." The article presents an amusing analogy by presenting MAPS 3 as though it was a movie sequel. "Nothing packs the movie theaters like a big-budget sequel. Moviegoers are willing to pay for a ticket because they are pretty sure they'll like it," Dean says. The remainder of the article lightly touches upon the items contained in MAPS 3 but presents no substantive discussion of any of them, either as to detail or about the various types issues that citizens have expressed in other forums such as in the Oklahoma Gazette or the Journal Record. Dean concludes the article by saying, "Get your popcorn ready for Dec. 8," but he should have added, "The Oklahoman will provide the Kool-Aid." Article 2, Page 4A: Opponents and Proponents. At page 4A, a sidebar article identifies groups which support and oppose MAPS 3 but provides no particular analysis. The website of those supporting MAPS 3 is identified but the NotThisMAPS Coalition's website is not. As a public service to rectify the Oklahoman's unequal treatment -- and not because I support that coalition's viewpoint which I don't -- I'll supply the omission: the opposing coalition's web address is http://nomaps3.com/. Was the omission an Oklahoman oversight? Maybe, but if so it was sloppy reporting all the same. If a proponent's website is identified, the opponent's website should be, also. Nothing new is presented and not even-handed reporting, just more Kool-Aid. Article 3, Page 4A: Items Included In MAPS 3. 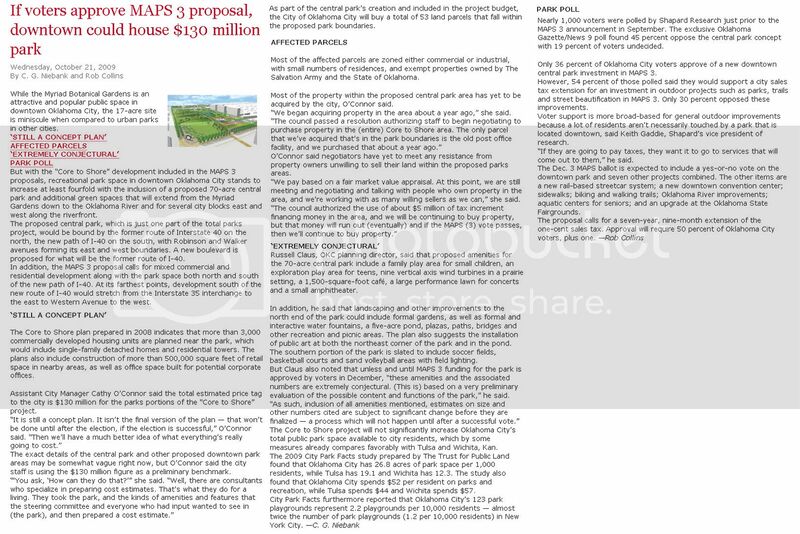 At page 4A, a "Did You Know" article identifies the projects intended to be accomplished with MAPS 3, plus the contingency funding item. The list is essentially a restatement of what's said at the city's MAPS 3 Summary website, a list which is duplicated at the Chamber's "Yes For Maps" website, all of which has been old news since the middle of September. The article would have been more accurate if it had identified the items as being included in the concurrent City Council non-binding resolution and not in the ballot or ordinance itself. Anyway, no new news, just more Kool-Aid. A state law [emphasis supplied only to emphasize vagueness in his reporting -- wouldn't a thorough article identify which state law he/she had in mind, if any, when writing such particular words?] commonly referred to as the single subject rule forbids cities [emphasis supplied; see discussion below] from asking voters to approve one tax for multiple purposes. Voters must vote on tax-funded projects one at a time. The serious and inherent weakness in Estes' article, however, is that he assumes, and does not investigate, whether such assertions have a sound basis in Oklahoma law. Maybe they do, but a solid journalist would also be aware of the possibility that maybe they don't, and he/she will explore, investigate, and give a more solid analysis than is involved in merely parroting what he/she may have been told. As to whether any "state law" exists, as Estes claimed that it did, I do not present myself as knowing the answer. I do present myself as one who has done a fair amount of recent legal research into whether "log rolling" -- the term typically used to identify single vs. multiple project funding by tax or bond measures -- is prohibited in city sales tax elections. In that research, I was unable to locate any constitutional provision, any state statute, or any appellate court decision which would confirm Estes' statement as being a correct statement of the law. Since the city asserts that the same exists, it is incumbent on a journalist to inquire, "What state law? What statute? What constitutional provision? What appellate court decision supports what you say?" Article 5, Section 57 of the Oklahoma Constitution does indeed contain an express prohibition against "log rolling" but the same provision only expressly refers to statewide level funding and does not mention political subdivisions, i.e., cities, towns, county revenue measures. The constitutional provision only speaks to acts of the Legislature but it has also been applied by the Supreme Court to statewide initiative referendum petitions, which is to say, a referendum which would be tantamount to a state statute if adopted. The recent decision in Fent v. State ex rel. Oklahoma Capitol Improvement Authority nicely illustrates both the principles involved and their application to statewide legislation. 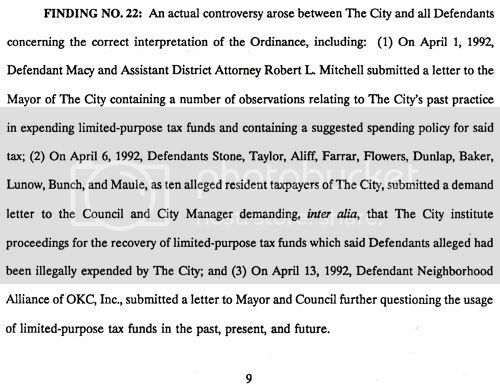 The short story is that I have been unable to locate a single decision by an Oklahoma appellate court which applied the same standard to a city sales tax election, and no one has informed me of any such which may exist. Should such a court decision, or, as Mr. Estes more generally put it, "a state law," I'll more than gladly report it and amend paragraphs such as this. As this is written, I seriously doubt that a specific constitutional provision, state statute, or appellate court decision exists which states what the city has stated and Mr. Estus reported. It is a failing of his article that the matter was not explored more particularly. So, although Mr. Estes' article was the best of the lot in the November 8 Oklahoman, his analysis was far from being complete. What's the real answer? I don't know. I suspect that the city doesn't know, either. But overstatement serves no good purpose, it only serves to fuel suspicion about whether (a) the city is honestly stating its legal conclusions to the public and/or (b) whether a journalist is really doing his/her job well in critically analyzing such public statements. As for the possibility that a senior editor may well have edited Mr. Estes' article by the time it went to press and that Estes may actually have done his job well ... yes, I admit to that possibility. But the bottom line is that the article bears the author's name, his signature, so to speak. Such a group is included in the documents passed by the city calling for the MAPS 3 election. Why, one might wonder, was an item on this topic even included in the November 8 mix of MAPS 3 articles? 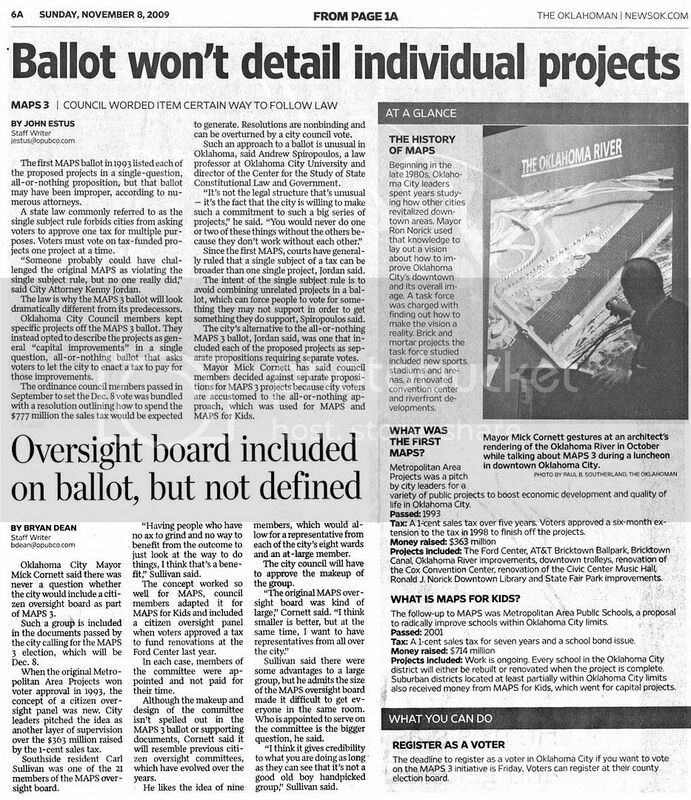 My interpretation is this: City and chamber leaders are aware that (1) the ballot form and proffered ordinance are so vague as to reasonably prompt some voters to inquire, "Well, the city tells me that if I vote 'Yes,' projects x, y, and z will be built; but (2) even if I'm agreeable to projects x, y, and z, what assurance do I have that x, y, and z will actually be built?'" As noted in John Estes' article, above, the City Council resolution which identifies the projects can be changed by the council at any time by a majority vote. Since the existence of an "oversight board" is apparently the key method of providing assurance to city voters that the original resolution would be adhered to by later incarnations of the council over a 7 year 9 month period of time, a good piece of journalism would have given analysis about such a board, how it might work, and whether its existence does actually provide voter assurance that the city council will stick with its guns over a 7 3/4 year period of time. The article did not do any of the above. It merely gives more Kool-Aid. Article 6, Page 6A: Brief MAPS History. In an "At A Glance" sidebar, a very brief history of previous MAPS initiatives is given. As an eye-blink summary, it does an adequate job. But, it does not discuss original MAPS cost overruns and the assertion that some have made that original MAPS money may have been diverted to non-MAPS purposes. Whether those criticisms have merit or not, I do not know. But, since such matters have been raised in the MAPS 3 discussion, it would have been good to address them, one way or another. 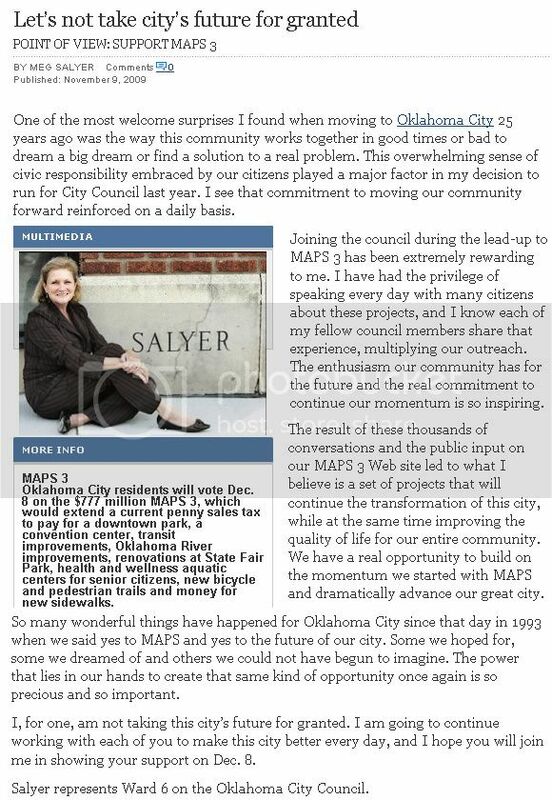 Oklahoman, November 9: Meg Salyer's Opinion. City Council member Meg Salyer who represents Ward 6 presents a brief and nicely written opinion piece about how she sees the city and why she supports MAPS 3. Journal Record, November 10: Is Deal With Firefighters In The Works? 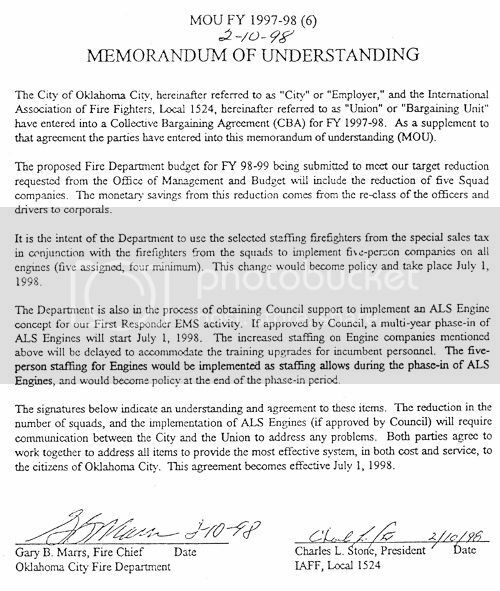 On November 6, Oklahoman reporter John Estus reported that a meeting between City Manager Jim Couch and Firefighter's Union president Phil Sipe would occur that day, November 6. This November 10 article by Brian Brus sounds as though progress is being made and that, possibly, the Firefighters may be prepared to do an about face in their opposition to MAPS 3. For a brief time, the article can be read at the Journal Record's website, but I've set it out for you below. 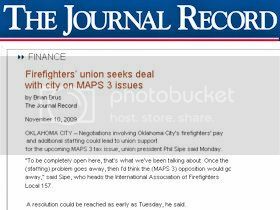 OKLAHOMA CITY – Negotiations involving Oklahoma City's firefighters' pay and additional staffing could lead to union support for the upcoming MAPS 3 tax issue, union president Phil Sipe said Monday. "To be completely open here, that's what we've been talking about. Once the (staffing) problem goes away, then I'd think the (MAPS 3) opposition would go away," said Sipe, who heads the International Association of Firefighters Local 157. ¶ A resolution could be reached as early as Tuesday, he said. Earlier this year, firefighters were granted a pay increase in arbitration after direct negotiations with City Hall broke down. 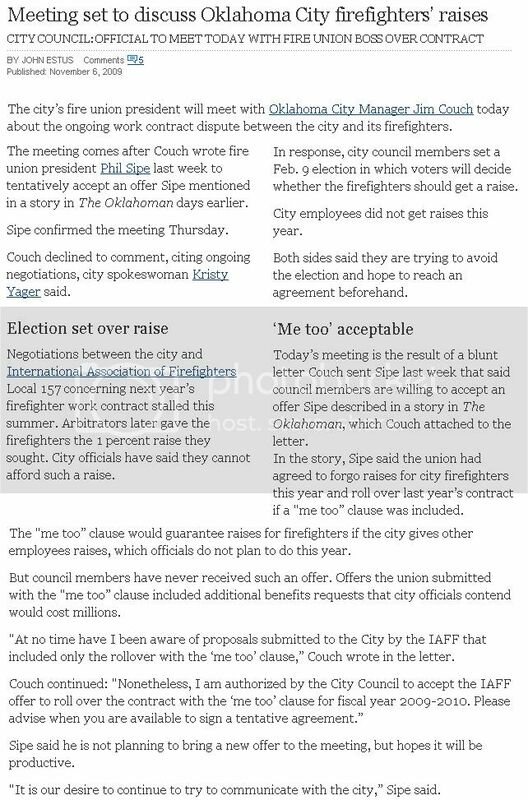 Sipe said the union in February offered to forego that raise upfront in exchange for a so-called "me too" clause that would guarantee a pay adjustment for firefighters later if the city decided to give other employees raises, too – something that had not been planned for this year. However, new negotiations reopened the issue at the end of October shortly after the filing of a political committee opposing MAPS 3, headed by Sipe and leadership in the local Fraternal Order of Police. Those groups said they will actively campaign against the $777 million tax issue for public projects because of what it lacks: funding for more emergency response workers. If passed in a citywide vote Dec. 8, MAPS 3 would provide for the creation of a 70-acre park downtown, a fixed-rail streetcar system and new convention center downtown, trails and sidewalks throughout the city, state fairgrounds improvements, wellness aquatic centers for senior citizens, and upgrades to facilities at the Oklahoma River at the heart of the metro area. The one-penny sales tax would be temporary, lasting about seven years. Sipe said the basis of the union's position is that the city needs more firefighters on duty already, and that projects under MAPS 3 would further stretch personnel. ¶ He suggested ways that city leaders could put more people on duty: "They could hire more people. They can, at their leisure, call in firefighters who are at home and not working and pay them. There are different options available," Sipe said. "We are willing to give our raises back if they address the staffing issues," Sipe said Monday. "We received a letter from (City Manager) Jim Couch on Friday, and that's the basis on which we are formulating a counteroffer. Hopefully that will be on Couch's desk real soon." ¶ City officials would not discuss ongoing negotiations, City Hall spokeswoman Kristy Yager said. Sipe said that although he has told city officials that the MAPS 3 opposition could evaporate, it's not entirely up to him. ¶ "That is one of the things that's really up to the membership. They're the ultimate authority here. If they're willing to reverse the previous stand they've taken and decide to rescind that original decision, then we're certainly willing to do a 180-degree turnaround and support it," Sipe said. The anti-MAPS 3 group is countered by only one other formal filing with the clerk's office: the Yes For MAPS Coalition, headed by Mayor Mick Cornett as chairman and former Mayors Kirk Humphreys and Ron Norick as co-treasurers. The Greater Oklahoma City Chamber is providing the main support for MAPS 3. Oklahoma Gazette, November 11: Water ... Oklahoma River, Canoe/Kayak Course, Senior Citizen Water/Wellness Centers. 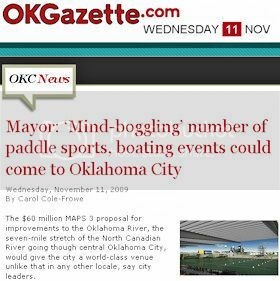 This Gazette installment on MAPS 3 by Carol Cole-Frowe presents a nice summary of what the city expects will come from Oklahoma River improvements, the canoe/kayak course, and senior citizen water/wellness facilities. You can read the article at the Gazette's website or you can click here for a printer-friendly version. If the article has a shortcoming, it is that Ms. Cole-Frowe did not inquire of city officials (or at least did not report that she did) as to how much, if any, of the developments identified were speculative and not set in stone, so to speak. Presumably what city leaders said about the planned central park is likewise true for the elements covered in this article. See, for example, statements reported in the Gazette's October 21 issue, above. The article contains no probing questions/answers, unlike previous Gazette MAPS 3 articles. Aside from that, Ms. Cole-Frowe's article presents a lengthy summary of what has already been presented elsewhere with perhaps a bit of news. Several of the quotes from the mayor seem to have been taken from his October 21 talk at the Chamber's "Breaking Through" luncheon, above, but he may have repeated himself to Ms. Cole-Frowe, I don't know. River Developments. $35 Million is identified as being for improvements on the Oklahoma River, including "a larger grandstand, new sound system, a scoreboard, a floating stage, river beautification and permanent sports-venue lighting," according to the article. The article says, "The grandstand would be built on the south bank of the river. Within the grandstand would be the floating stage where a variety of entertainment could be staged, from musical performances to plays." In addition to the video linked in the article (which appears below), several others are available at the Oklahoma City Boathouse Foundation website, aka "the boathouse district." Canoe/Kayak Course. $25 Million would be spent on an associated project, a canoe/kayak course at an undetermined location. It would be separate from the Oklahoma River but would presumably be on the north side of the river. The article quotes David Holt as saying, "'There is no exact location,' said David Holt, the mayor’s chief of staff. 'Conventional wisdom has been that it would be near (or) in the Boathouse District. The most likely area would be the north shore where all the privately funded boathouses are, but obviously the land is not acquired at this time.'" A nicely done video by the Oklahoma City Boathouse foundation, linked to in the article, appears below. For other related videos by the same organization, click the following links: A Vision For the Future On the Oklahoma River and Boathouse District website. Senior Aquatic/Wellness Centers. Nothing new about this $50 Million item was said in the article that hasn't been said already but with a possible exception being what Mayor Cornett was reported to say about operational costs of the 4 or 5 facilities which are contemplated. The article reports, "He said if the MAPS 3 measure passes Dec. 8, the city would likely be looking to partner with perhaps YMCAs or universities to operate the facilities." About operational costs, the article quotes Kristy Yager, head of the city's public information office, as saying, "We do not have operational costs on the aquatic centers since we do not know how many there will be or how big they will be." The article notes, "The $50 million for aquatic centers will likely be much more than seniors got from the first MAPS vote." In my interview David Holt, the Mayor's Chief of Staff, David indicated that the Mayor had in mind something along the lines of such a facility in North Little Rock, Arkansas. Mayor Patrick Hayes of North Little Rock will be the featured speaker at the Chamber's next "Breaking Through" luncheon on November 16. November 12 OKC Press Release. Early this afternoon, the city issued a press release, fully set out below, which speaks to a proposal by the city to resolve issues with the local Firefighters Union and the Fraternal Order of Police concerning staffing issues raised by those groups in its NotTHISMaps coalition. My understanding is that the proposal will be voted on by union members at meetings to be held this evening. I won't otherwise comment since I am not privy to the proposal and don't presently understand the nuances in the words of the press release. Flanked by the County’s top prosecutor and a former fire chief, Oklahoma City Mayor Mick Cornett today addressed the past impact that MAPS has had on public safety, and discussed a proposal to continue the City’s long-standing tradition of supporting public safety by committing the use tax created by MAPS 3 to police and fire protection. If MAPS 3 passes on December 8, this commitment could mean that the community will immediately benefit from the addition of new police officers and firefighters, in addition to protecting current public safety positions. The practice of supporting public safety with a MAPS use tax began in 2001 with the passage of MAPS for Kids. "Right now, at a critical time in our City’s history, we’re facing efforts to confuse our voters into thinking that somehow the passage of MAPS will create public safety issues," said Mayor Cornett. "I can assure you that if we don’t pass MAPS, our public safety issues multiply." Mayor Cornett explained that in 2001, the voters of Oklahoma City passed MAPS for Kids. In Oklahoma, sales taxes are accompanied by use taxes, which are primarily paid by businesses on products purchased from out of state and intended to be used in Oklahoma. The MAPS for Kids use tax has been applied to public safety capital, such as police cars, fire trucks, police helicopters, technology and fire stations. The total investment from MAPS for Kids in public safety is a staggering $60 million. "We believe the use tax could add new police officers and firefighters, while also protecting current positions," said Mayor Cornett. "In a time that cities across the nation and in Oklahoma are laying off public safety officers, we're grateful to have this opportunity. But that option goes away without passage of MAPS 3." Mayor Cornett also discussed the City's overall commitment to public safety. Over two-thirds of the City's general fund is applied towards police and fire protection, and over a quarter-of-a-billion dollars ($285 million) of City funds are spent every year on public safety. "The economic impact of MAPS over the years has given us more resources to devote to public safety, and we have," said Mayor Cornett. "Our community has a proud history of supporting public safety, and we are grateful for the service of each police officer and firefighter. We hope that the economic impact of MAPS is allowed to continue, which increases our overall resources. And we hope that the impact of the use tax on public safety is also allowed to continue, because that can immediately help to maintain and enhance our public safety departments." Oklahoma County District Attorney David Prater and Oklahoma City Councilman Gary Marrs also addressed the potential impact MAPS 3 could have on public safety. "I recognize what MAPS for Kids has done for public safety, and I enthusiastically support any plan for MAPS 3 that can put more police officers on the street," said Prater. "As a former police officer, I know that commitment means a lot to these officers. As a citizen and a prosecutor, I am appreciative for what MAPS for Kids has done for public safety, and I am pleased that MAPS 3 could continue that commitment, in addition to the other projects that will push our City forward." "The potential impact of the MAPS 3 use tax on the fire department is significant for the firefighters and for our citizens," said Marrs, who is also the former Oklahoma City Fire Chief. "MAPS has been a critical element to our public safety funding in the past, and I’m hopeful we can continue that with MAPS 3." MAPS 3 is the continuation of the MAPS initiative that first began in 1993. The proposed MAPS 3 does not increase the sales tax rate from its current level. It dedicates one cent of sales tax for seven years and nine months to the construction of eight projects. The projects include a world-class park, transit, a new convention center, sidewalks, trails, health and wellness centers for seniors, improvements at the State Fairgrounds, and improvements on the Oklahoma River. More information can be found at www.okc.gov/maps3. 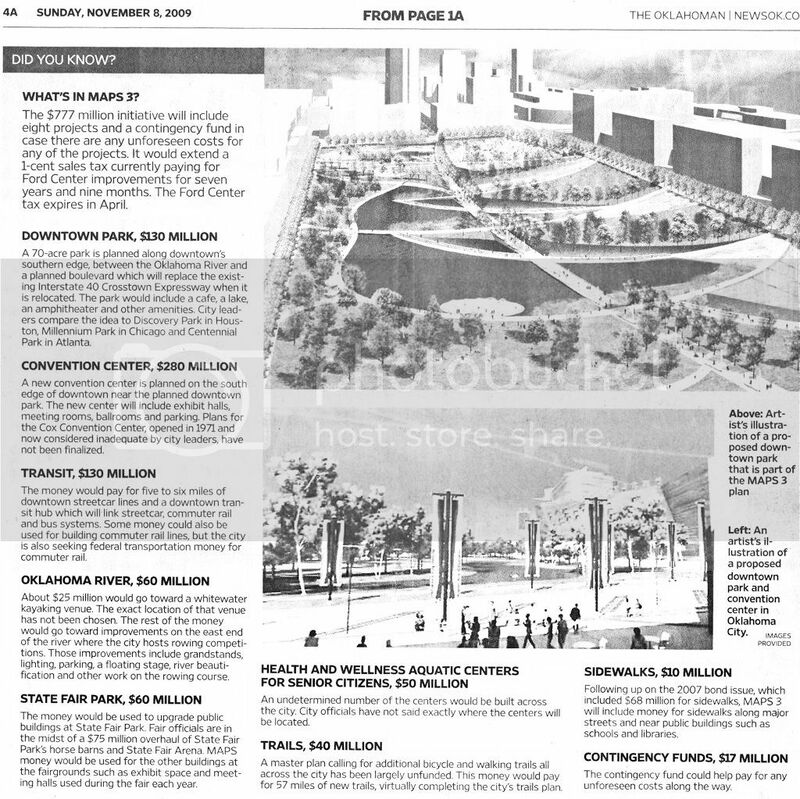 The Oklahoman, November 12: The City's Announcement. Oklahoman reporter John Estus reported on the development later in the afternoon, presumably to be carried in tomorrow's paper. Use taxes are charged instead of sales taxes to businesses who buy items from outside Oklahoma City for use within the city. A use tax typically accompanies a voter-approved sales tax. City records show public safety has received $60 million of use tax revenue from MAPS For Kids, which passed in 2001. The money has been used for public safety capital projects. Union officials said they would have no comment on the use tax plan or MAPS 3 until a news conference Friday. Cornett declined to discuss specifics of the latest contract offer the city made to the unions this past week, but said MAPS 3 use tax revenue could pay for additional police officers and firefighters in addition to capital projects. 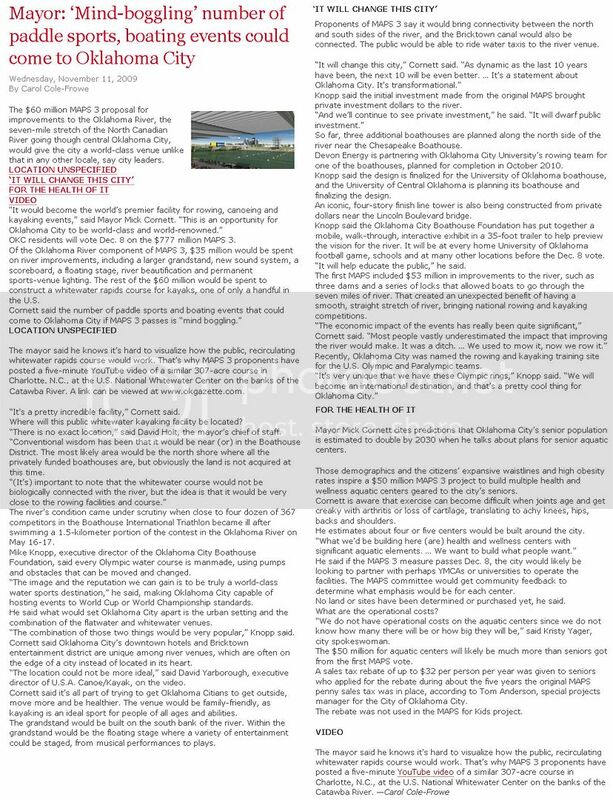 Also, see OkcBiz for its less comprehensive coverage of this event ... basically a summation of the city's press release. November 13, the Journal Record: Its report on the above November 12 developments. Cornett's presentation countered the position held by the Not This MAPS Coalition, whose leadership contends that the $777 million MAPS 3 tax issue coming up for public vote Dec. 8 would further stretch the city’s emergency personnel resources. The coalition's chairman is Phil Sipe, who heads the International Association of Firefighters Local 157; Gil Hensley, president of the Fraternal Order of Police Lodge 123, is vice chairman. When the MAPS 3 package of civic development projects was first announced, union leaders said they could not support it because the issue lacked funding for additional emergency response workers. In October, they registered the political committee at City Hall to actively campaign against MAPS 3. While available to non-subscribers, the article is here on the Journal Record's website. It is also available here in a printer friendly version. The unions were expected to meet last night and vote upon an offer submitted by the city, presumably concerning the use tax which would accompany MAPS 3 and most likely a commitment to use some or all such tax proceeds for police and firefighter staffing needs, however no details of the city's proposal have been publicaly available. Reports are expected this morning about the outcomes of those meetings and the content of the city's offer.